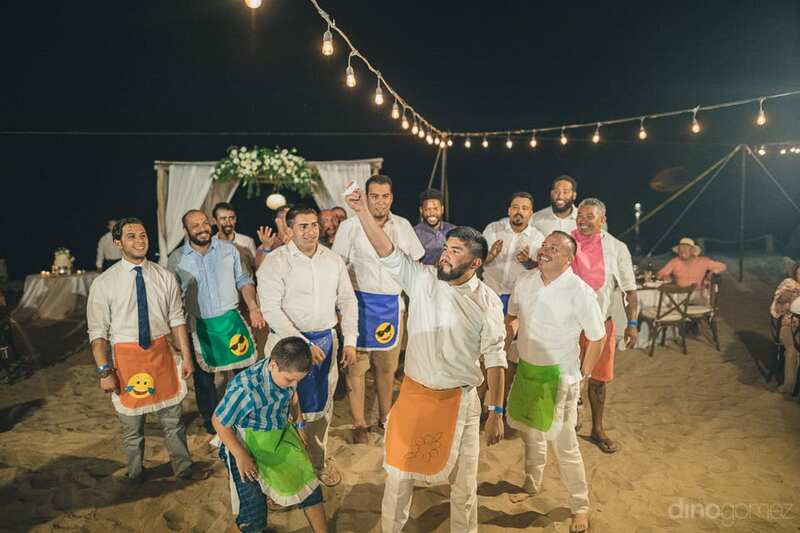 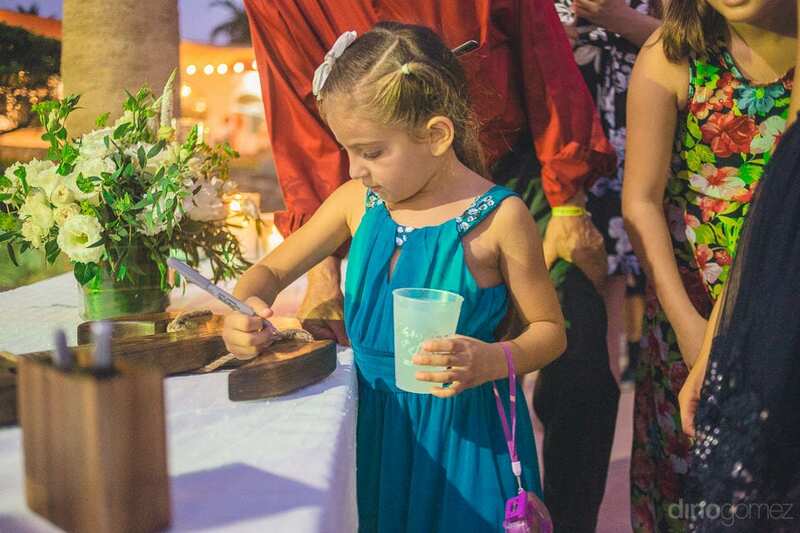 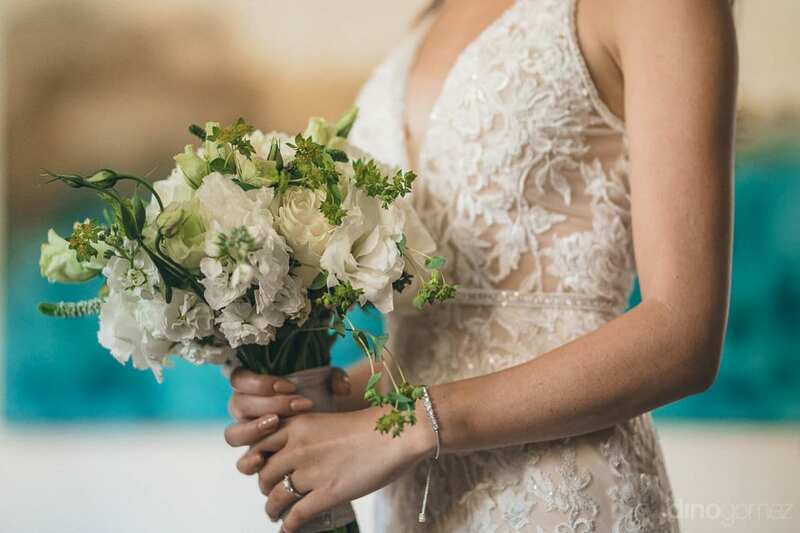 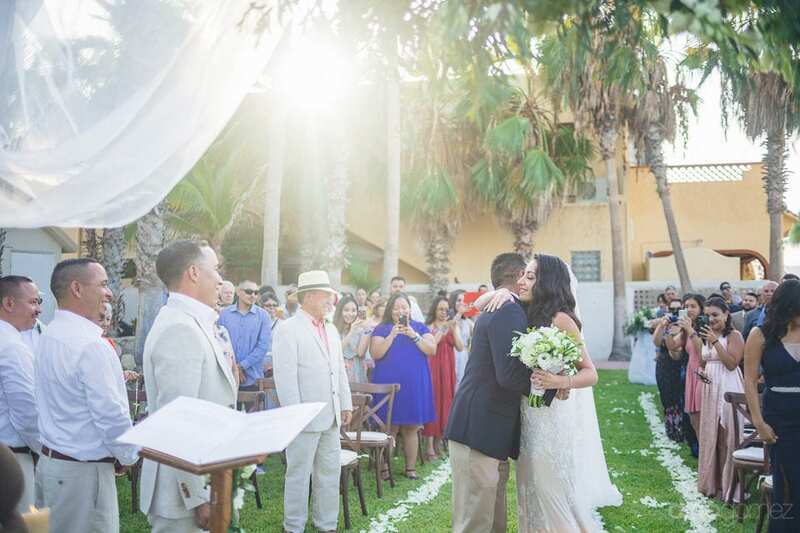 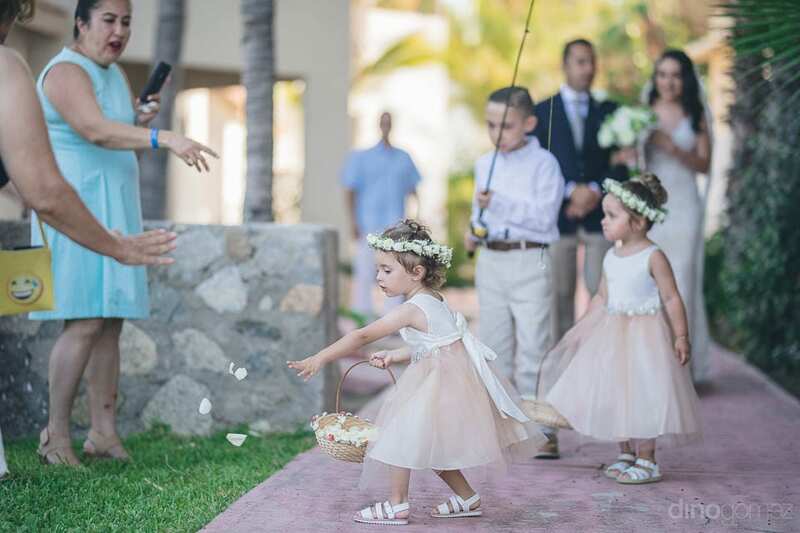 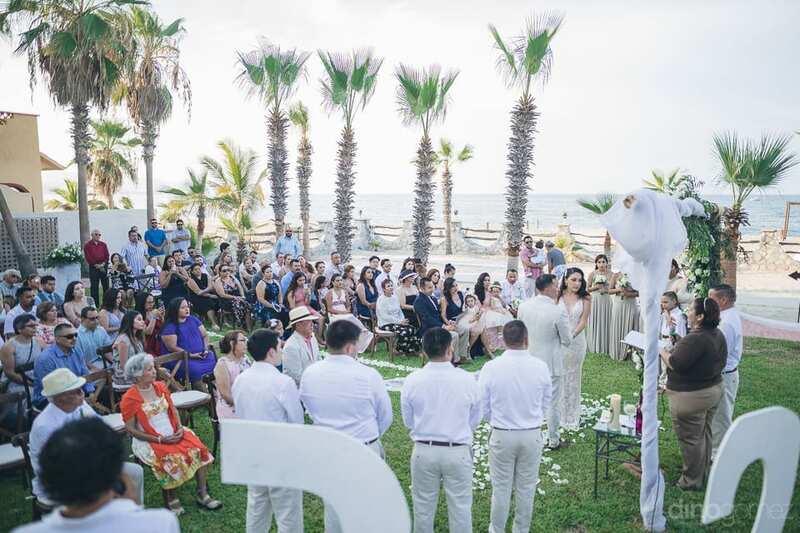 Venues for weddings near Los Cabos. 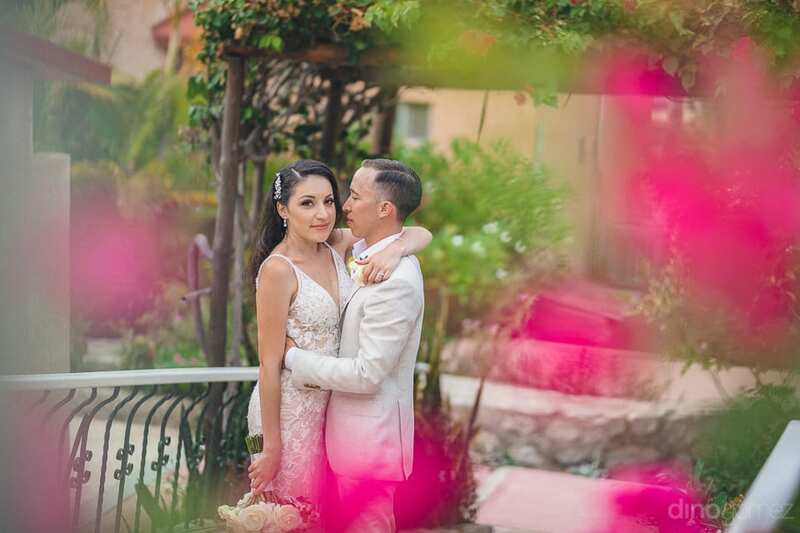 Check these amazing Photos! 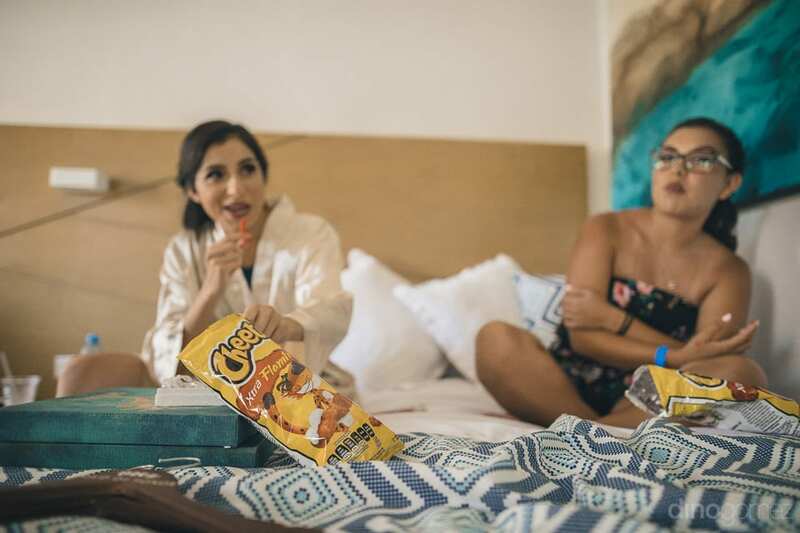 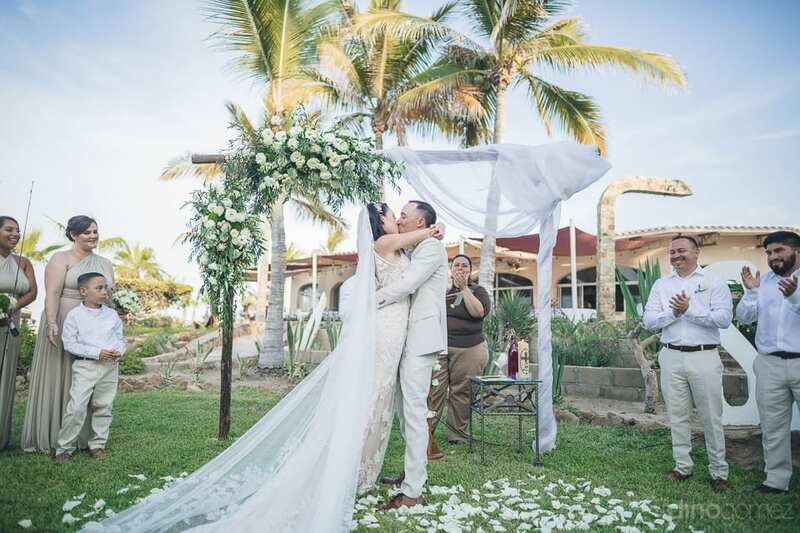 Enjoy the preview from Christina & Steve at the Buenavista Hotel in Los Barriles, Baja Sur, Mexico! 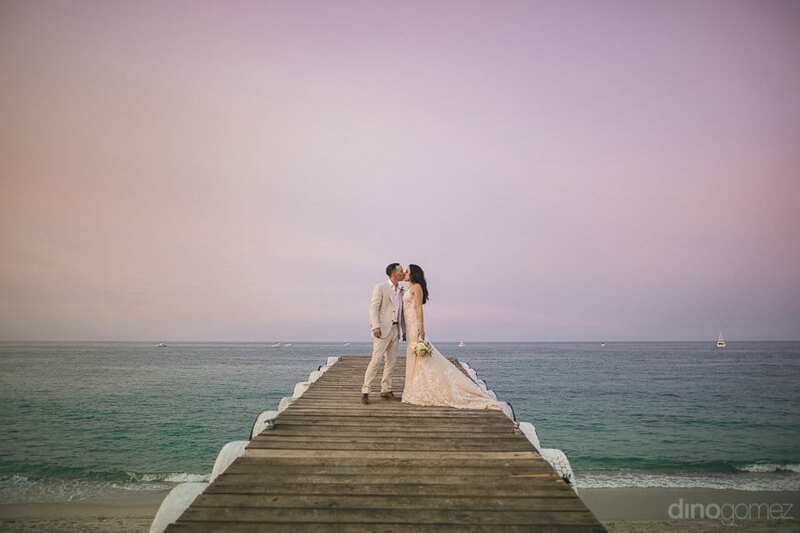 You can review the engagement session of Christina & Steve at the unique Las Cuevas, Baja Sur here! 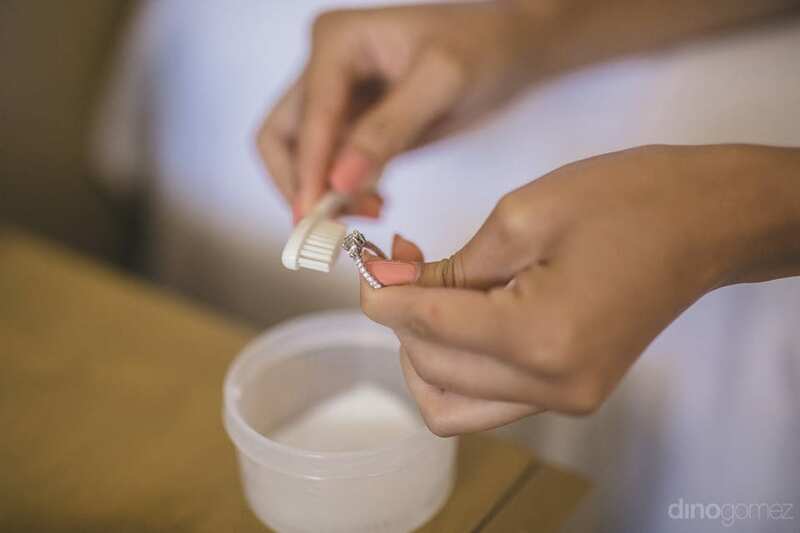 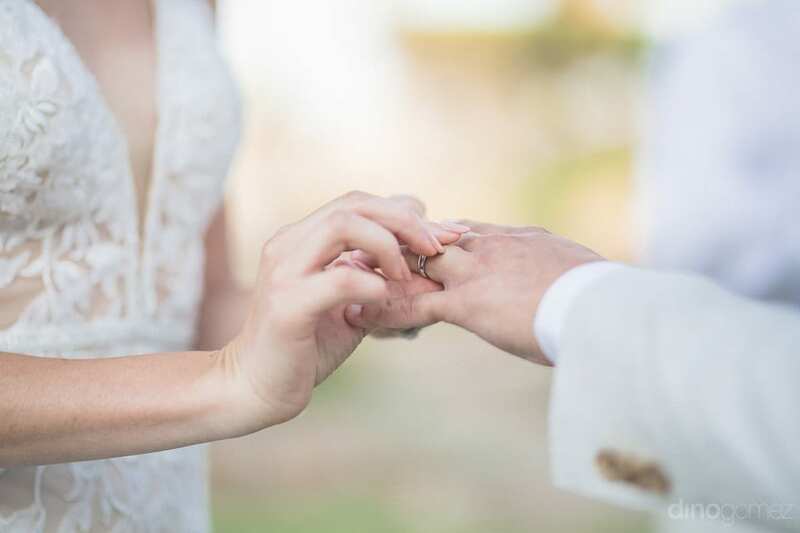 It is a dream of almost every single person on this planet to marry and spend their whole life with the first love of their life. 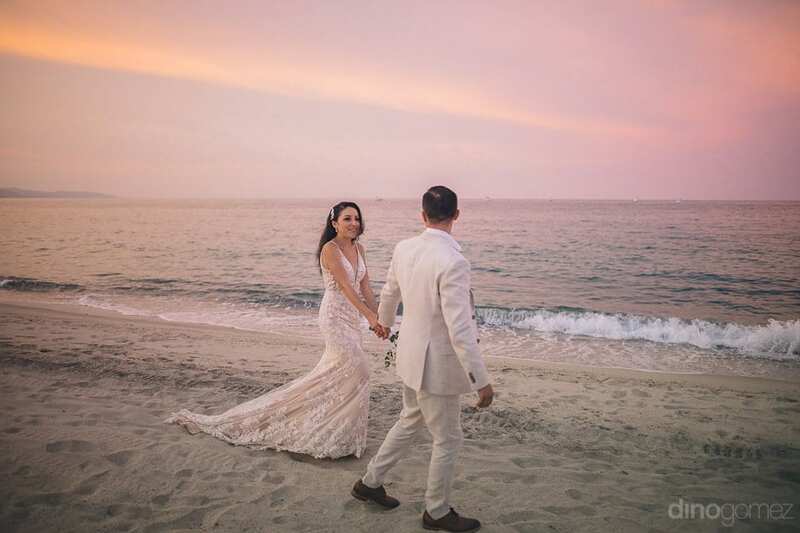 It is not hidden that first love is full of honesty, innocence and sincerity; but only a very few are lucky enough to marry their first love. 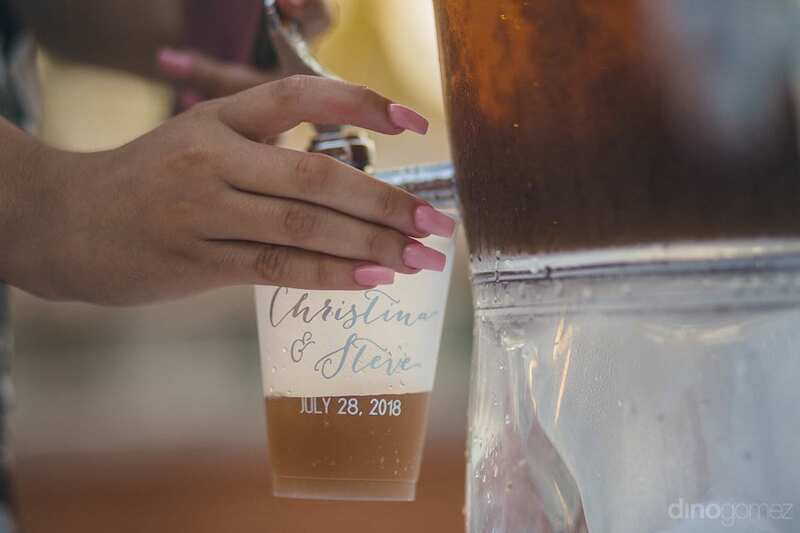 Our lovely couple; Christina and Steve are really blessed in this case and is one among such lucky couples. 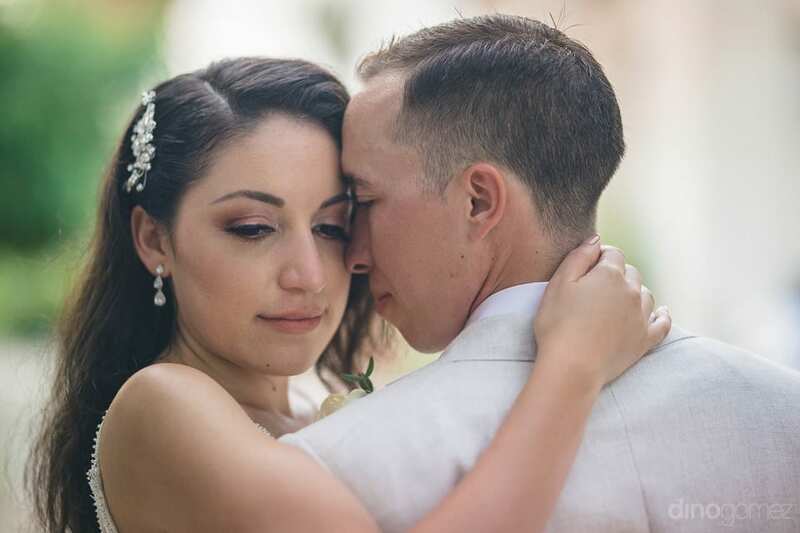 These childhood sweethearts know each other since they were just 14 years old and they have been in love with each other since then. 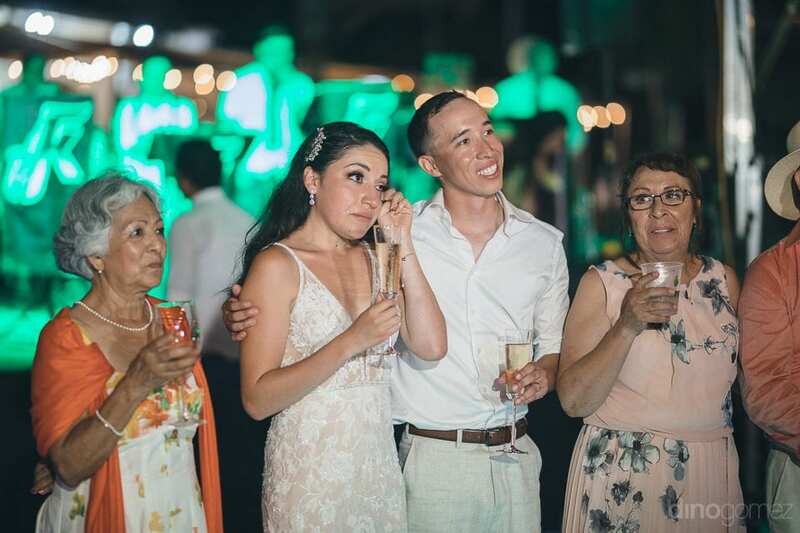 It gives goose bumps to know such a couple who knew ever since their childhood that they will marry one day and start their own family. 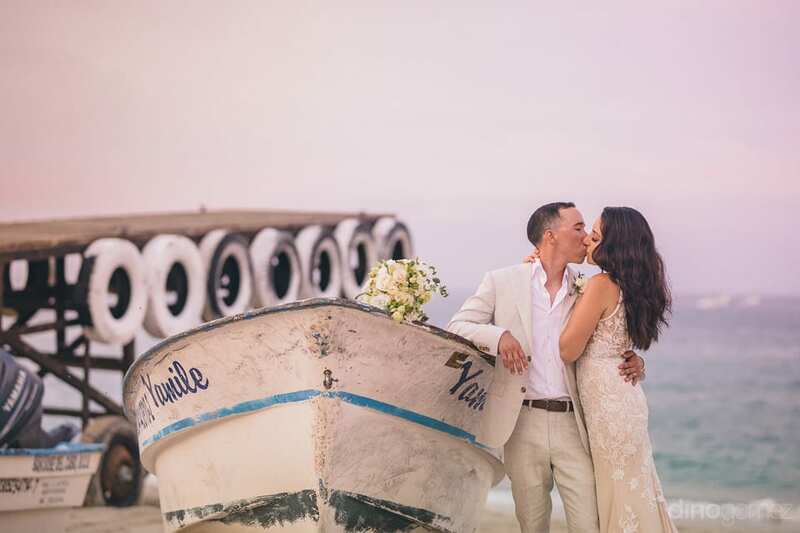 Our handsome groom is a fisherman and a captain and the gorgeous bride, Christina likes mermaids a lot. 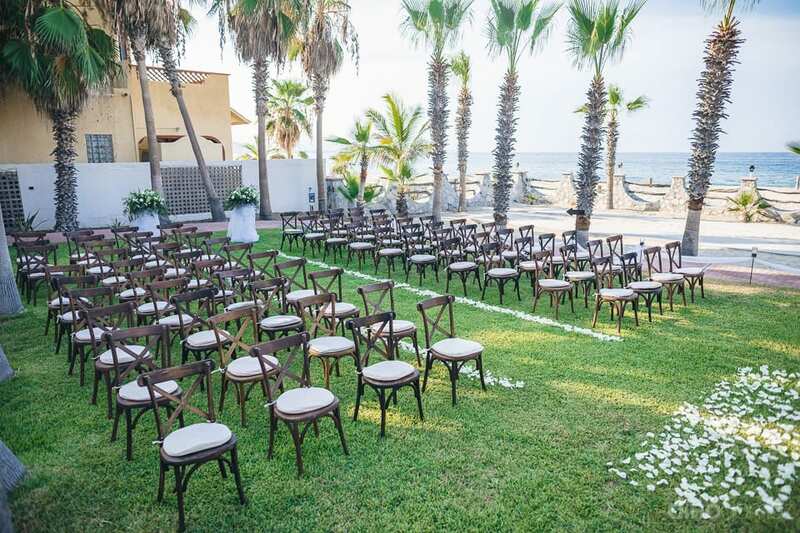 So, it came as no surprise to their families that the wedding venue will be near the sea. 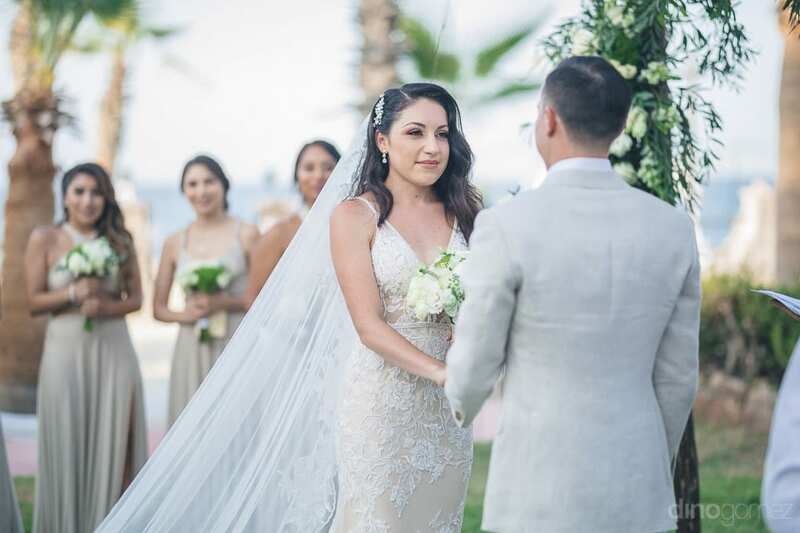 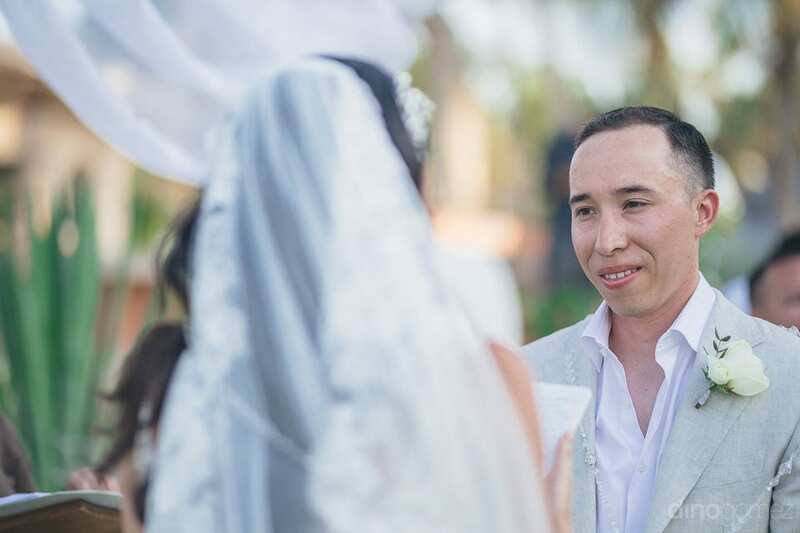 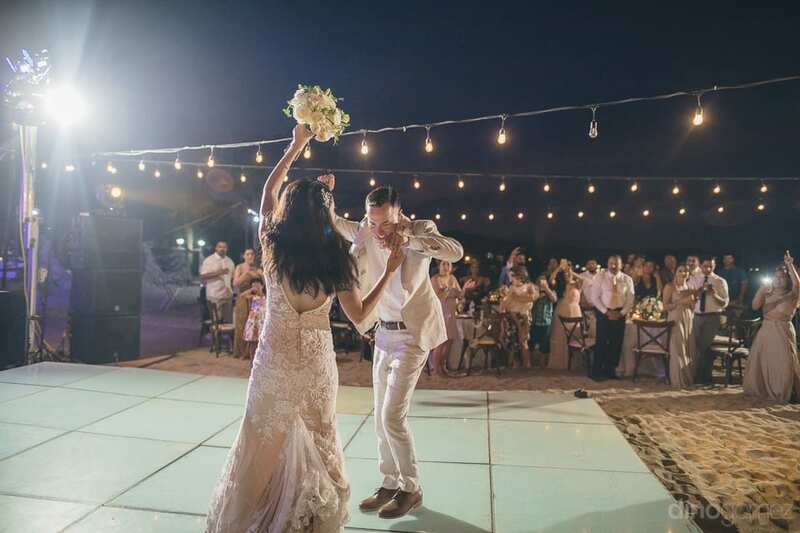 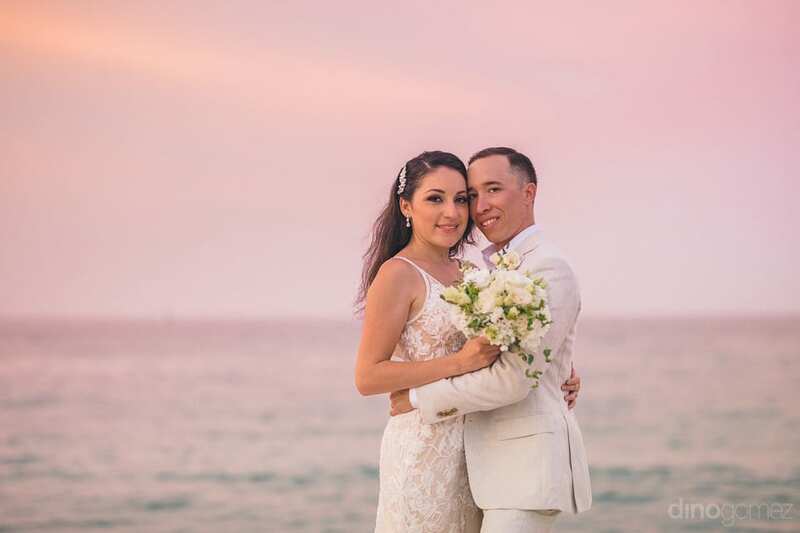 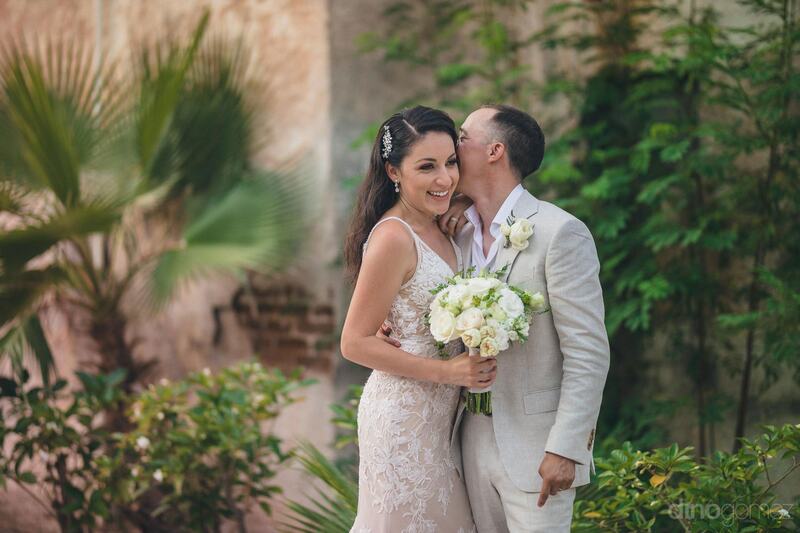 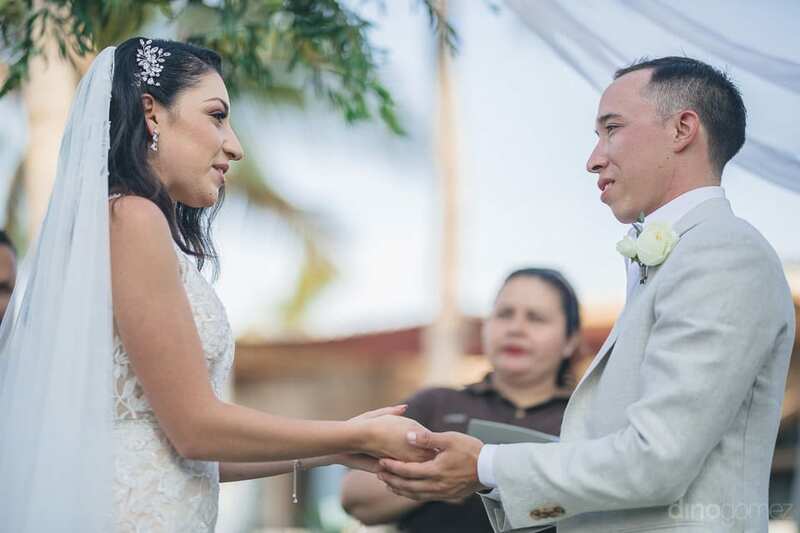 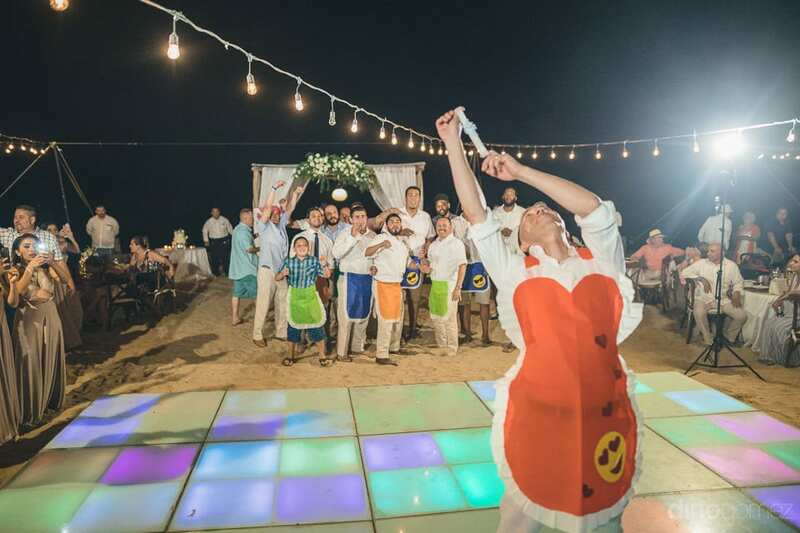 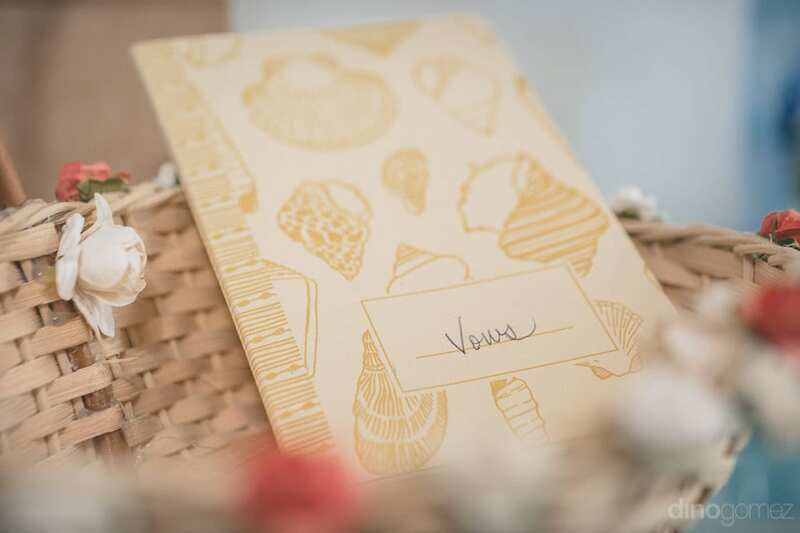 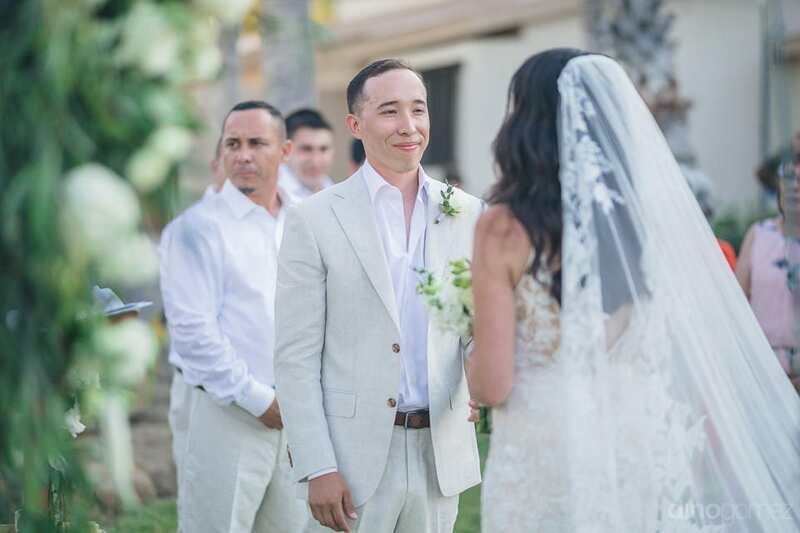 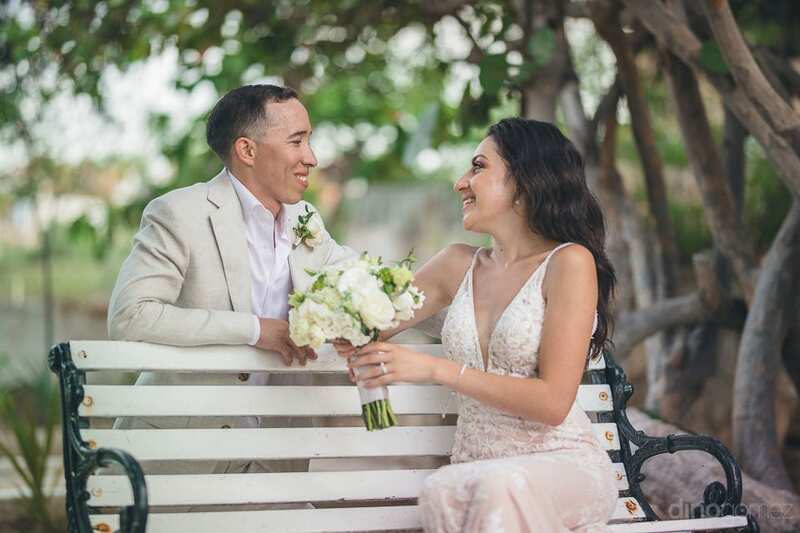 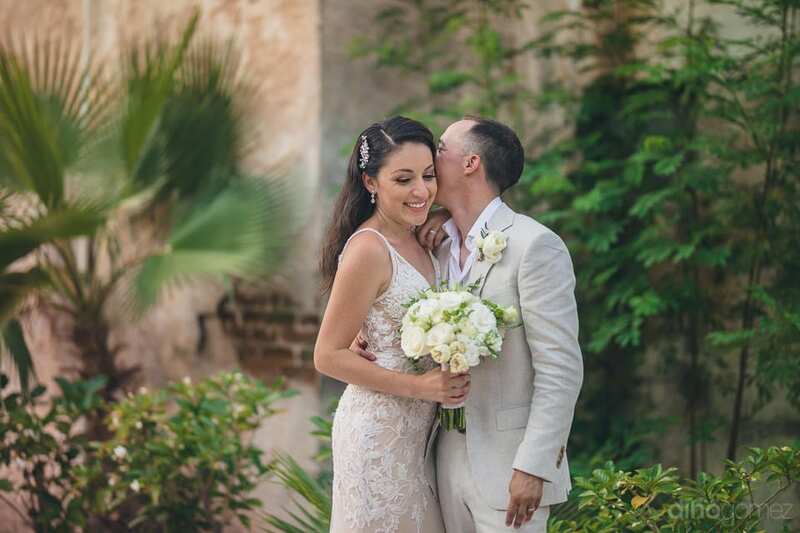 The lovely couple selected the Hotel Buena Vista Beach Resort for the wedding ceremonies. 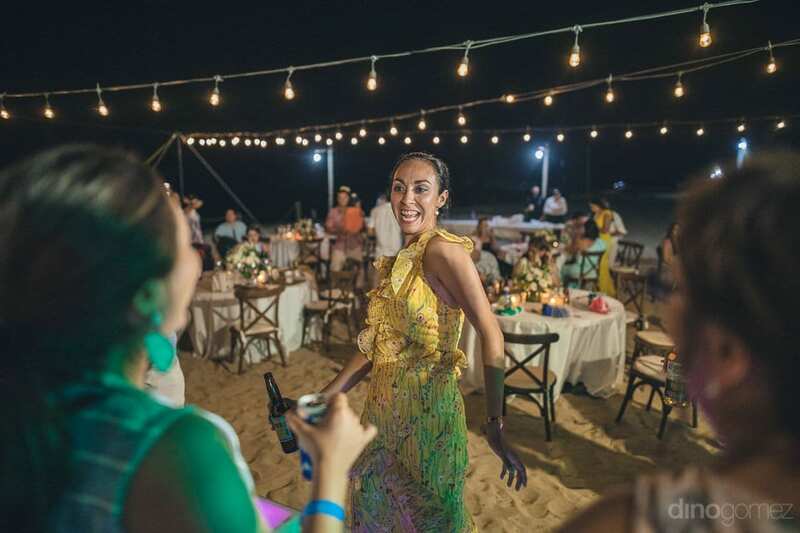 Reception party too was held on the beachside venue of the Hotel Buena Vista Beach Resort. 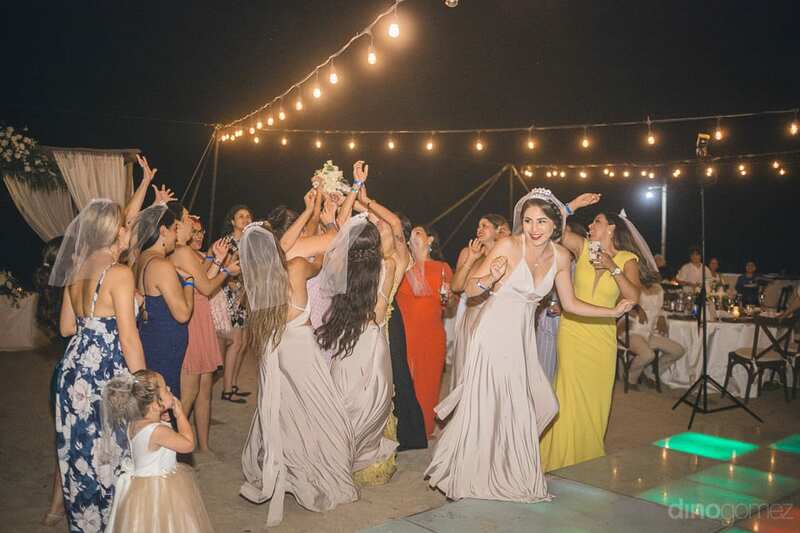 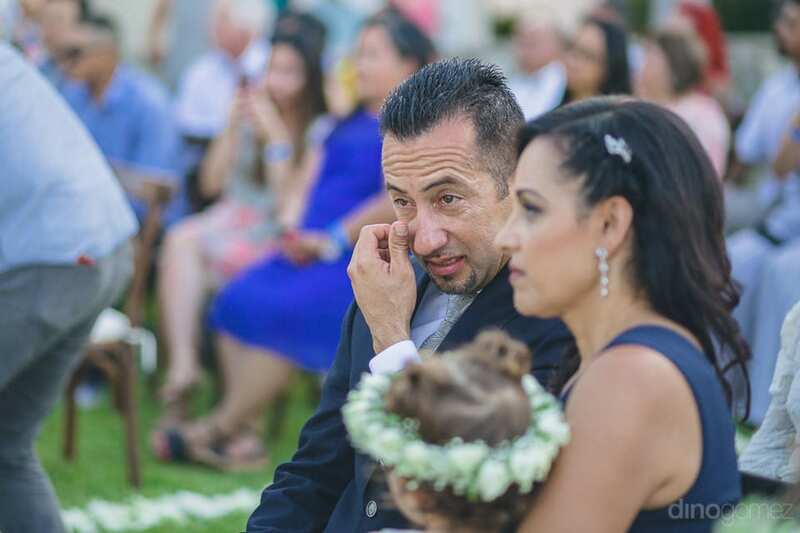 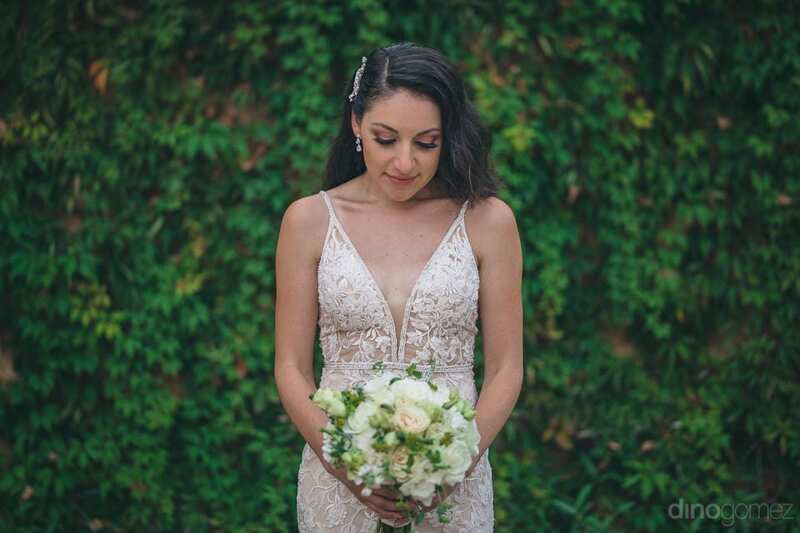 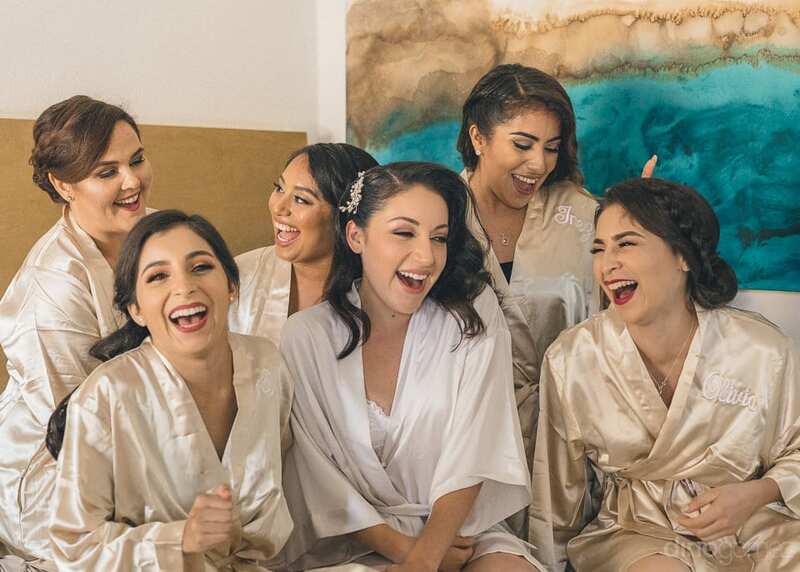 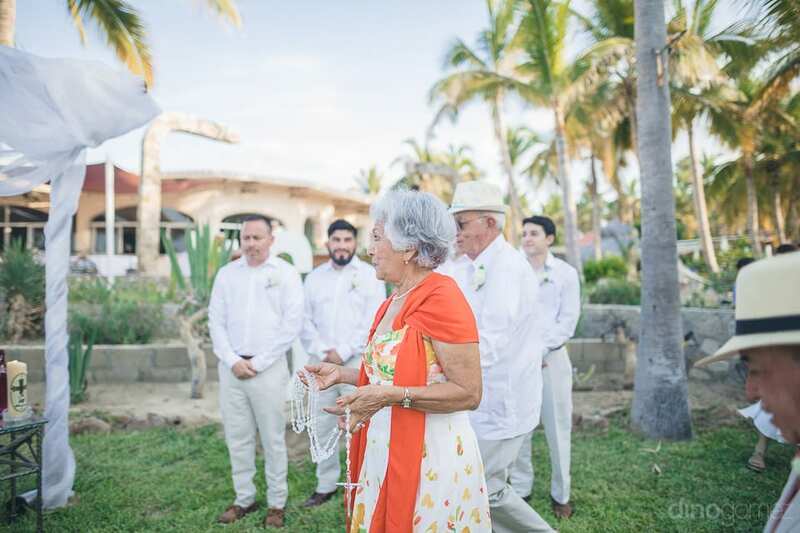 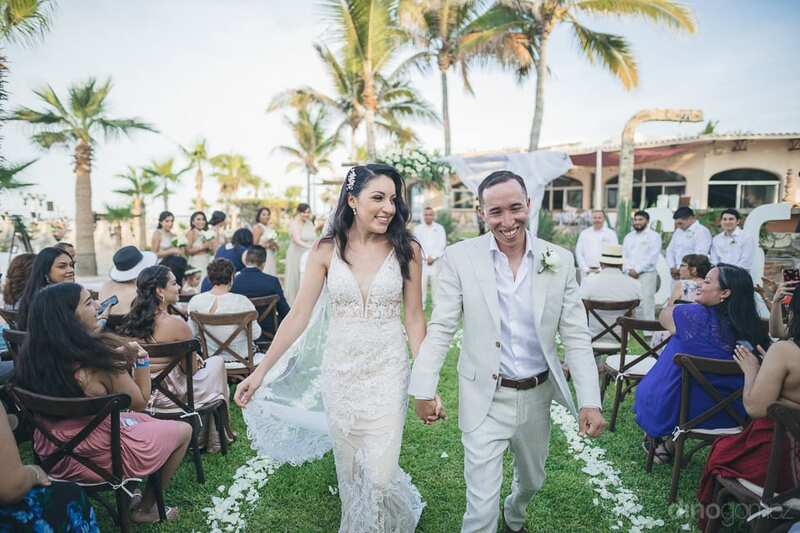 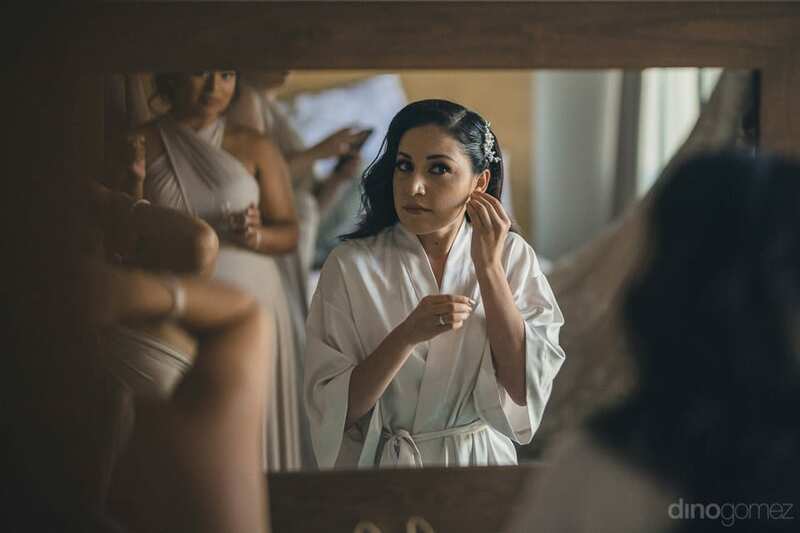 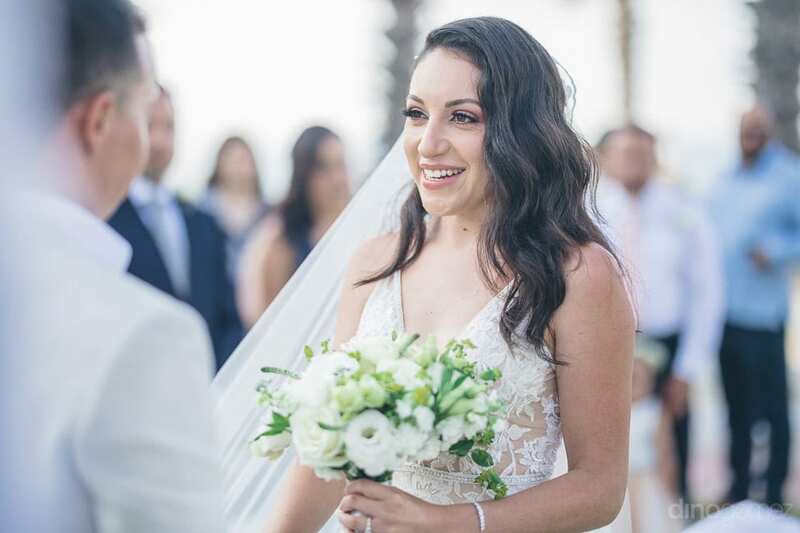 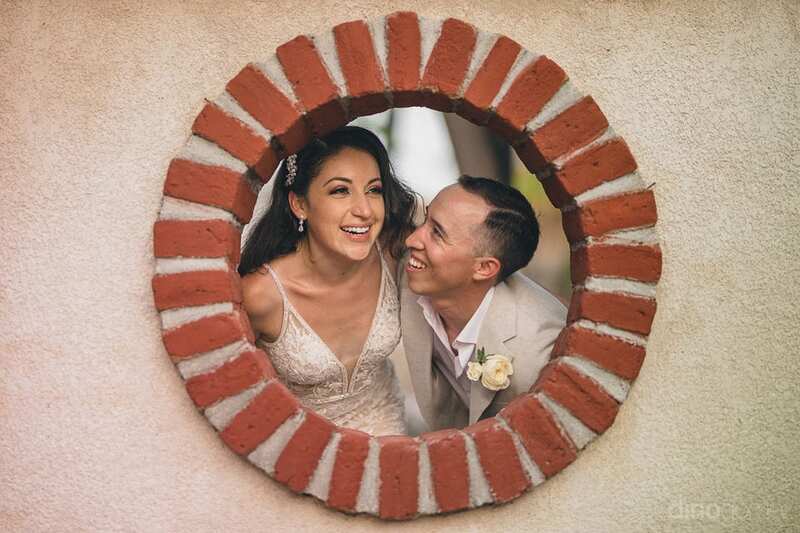 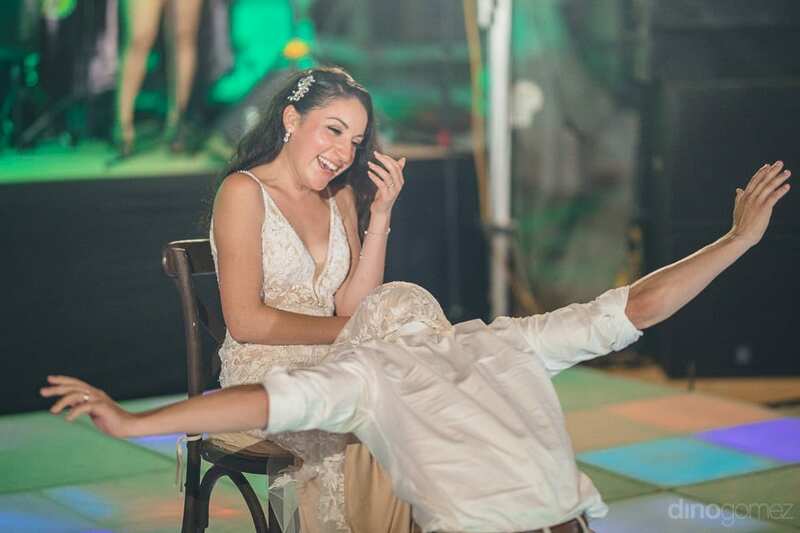 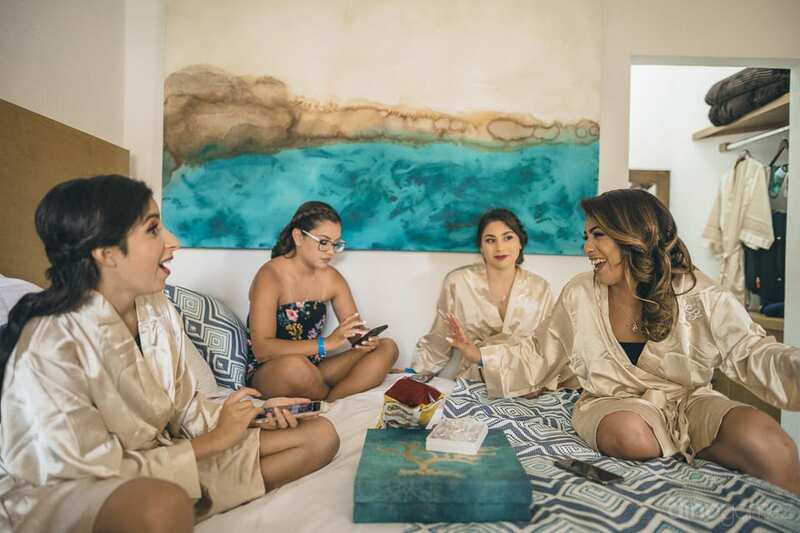 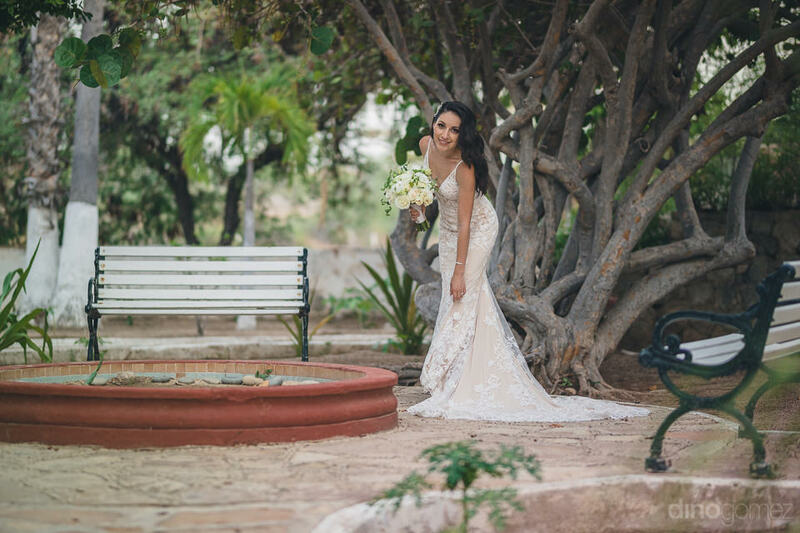 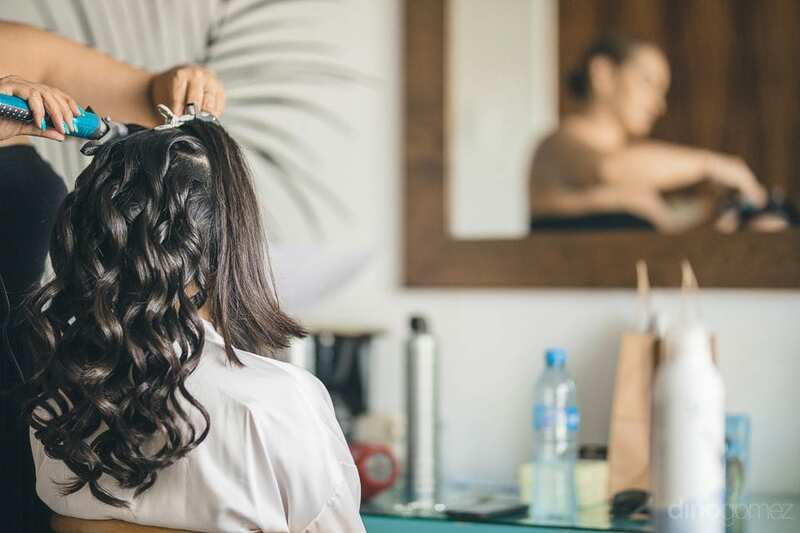 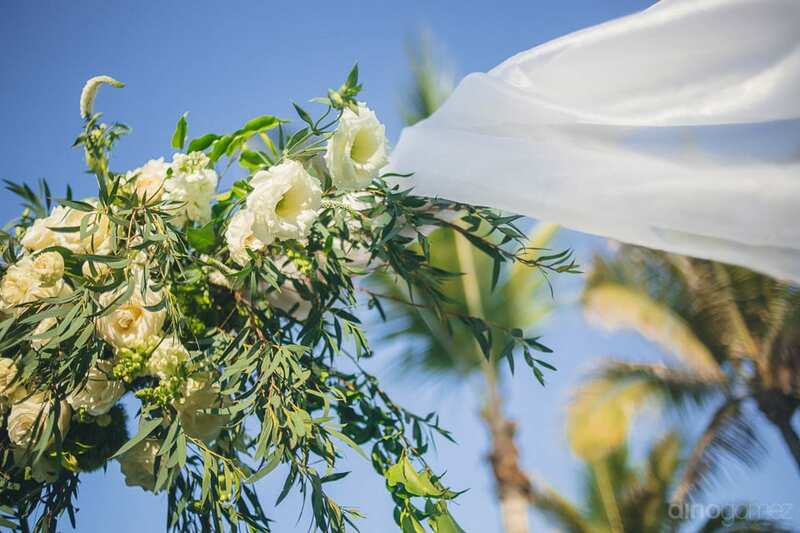 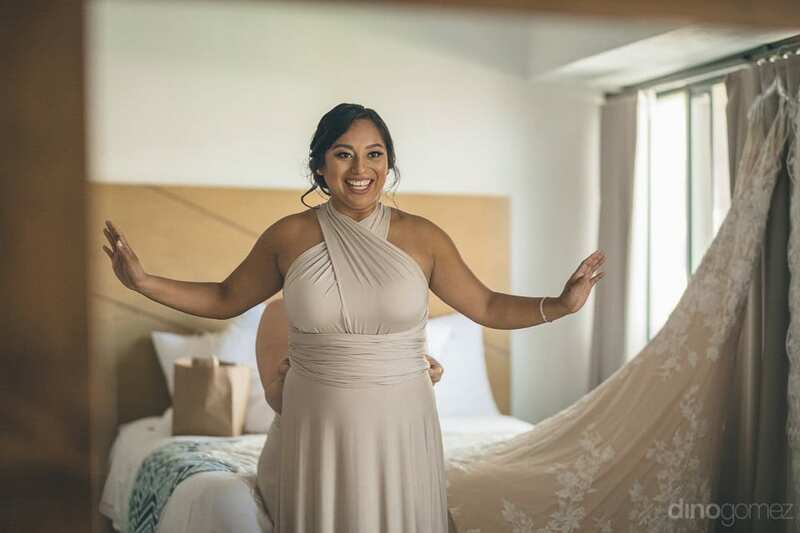 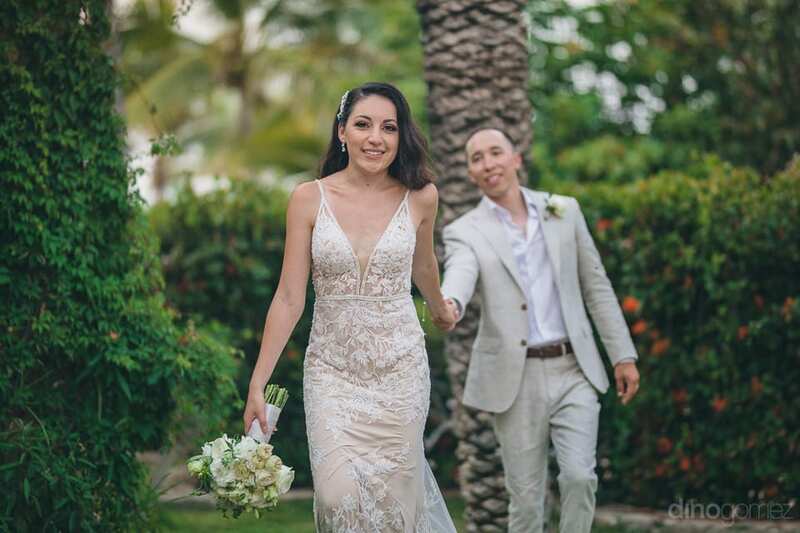 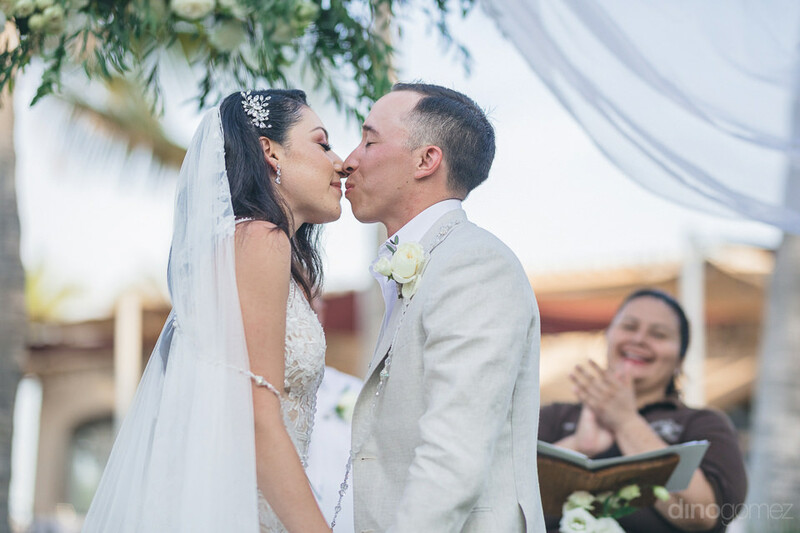 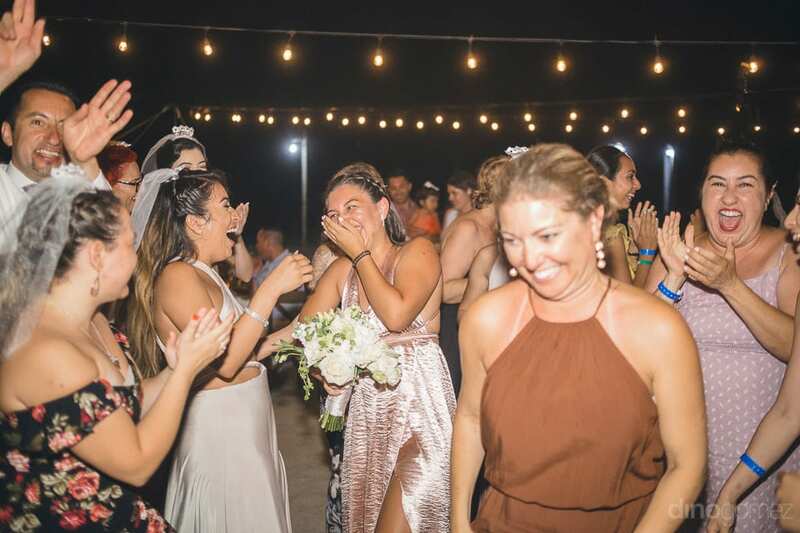 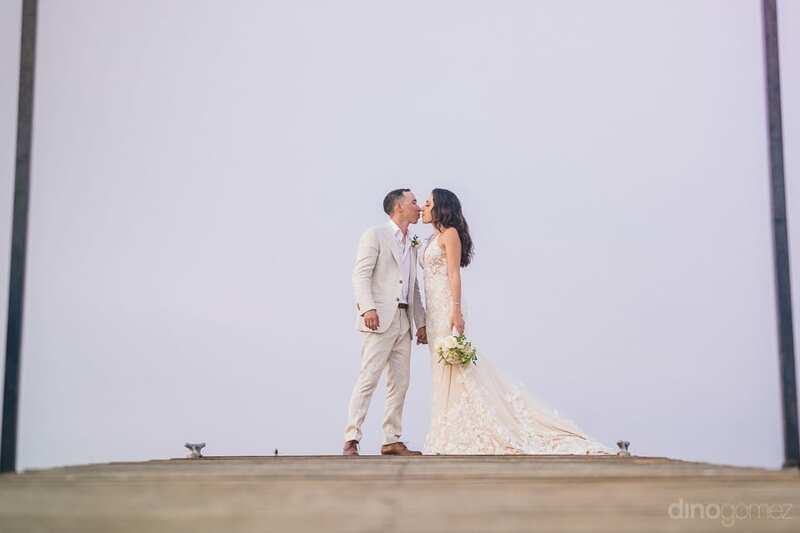 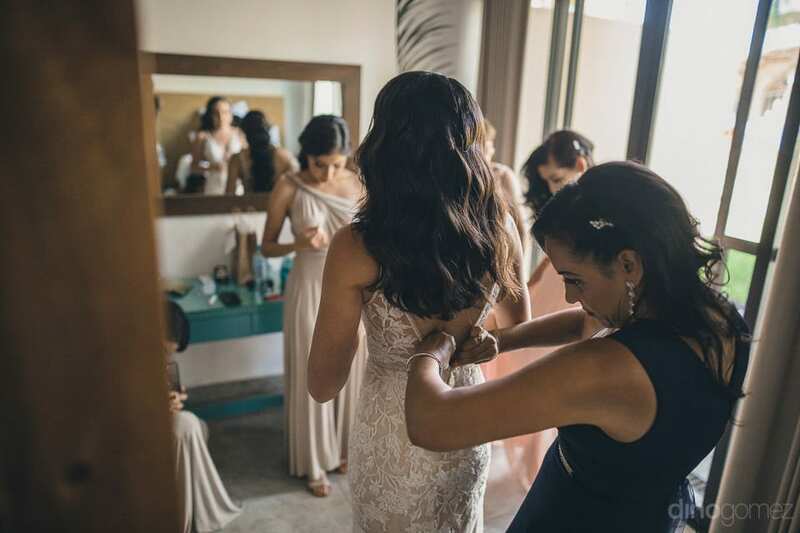 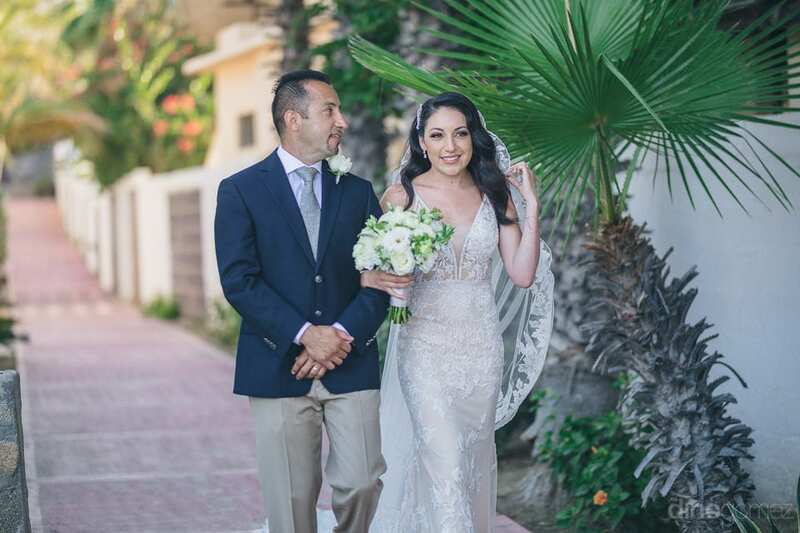 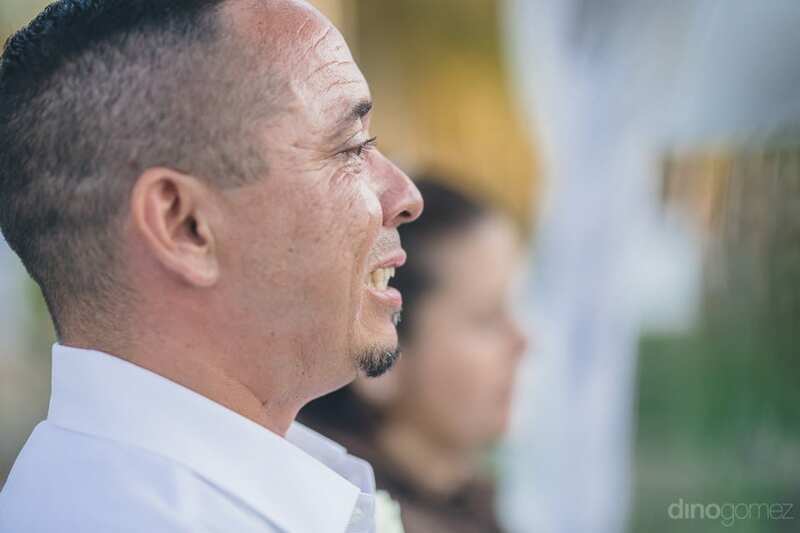 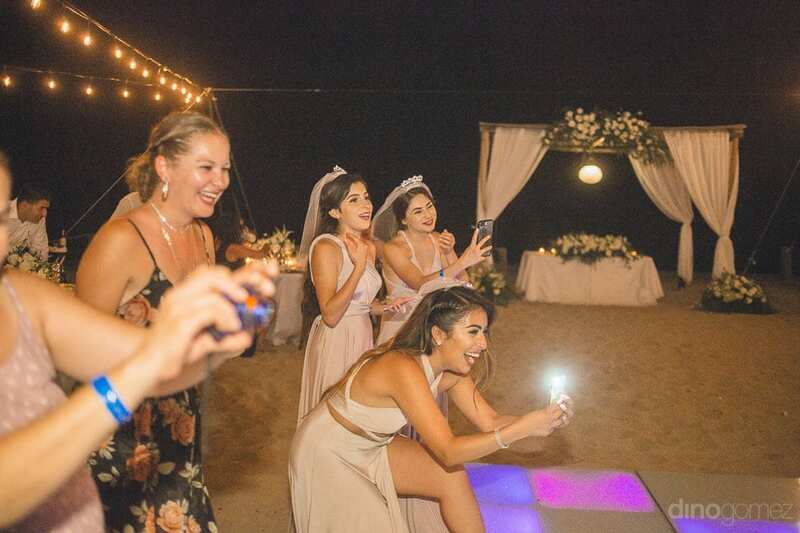 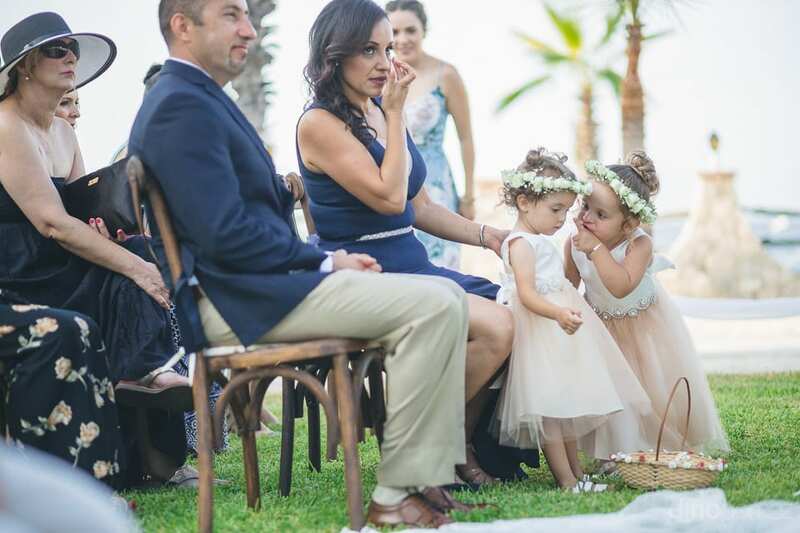 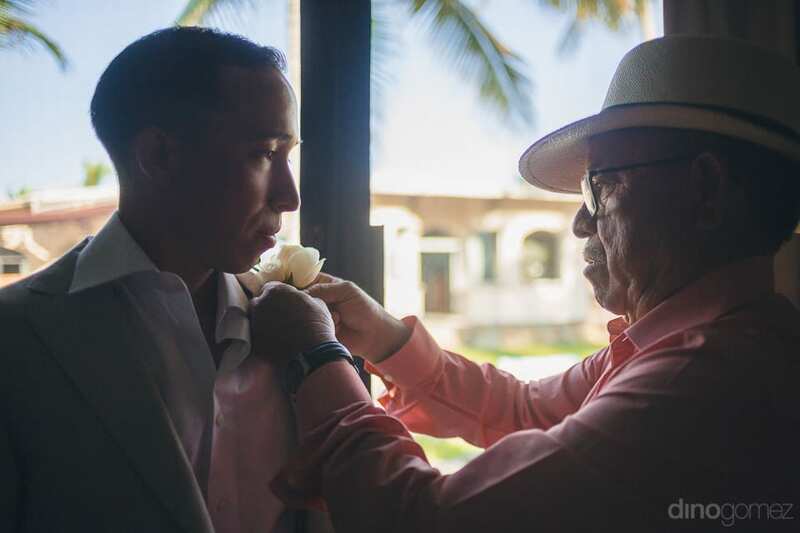 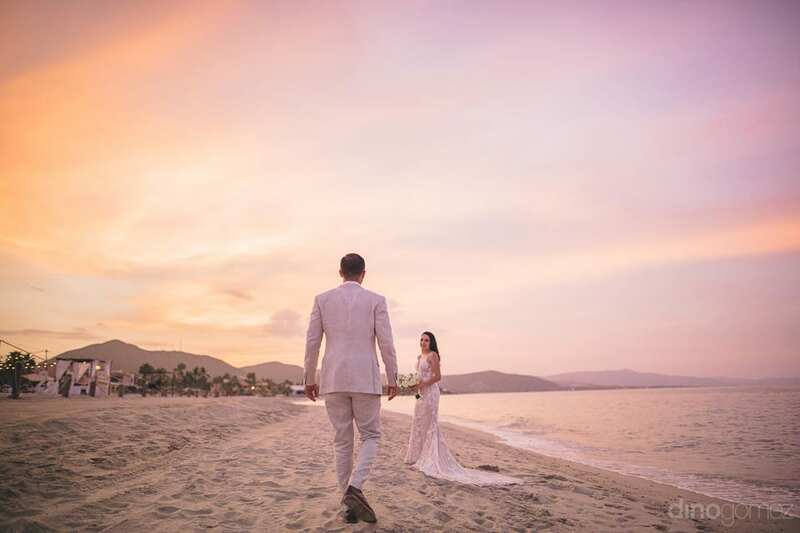 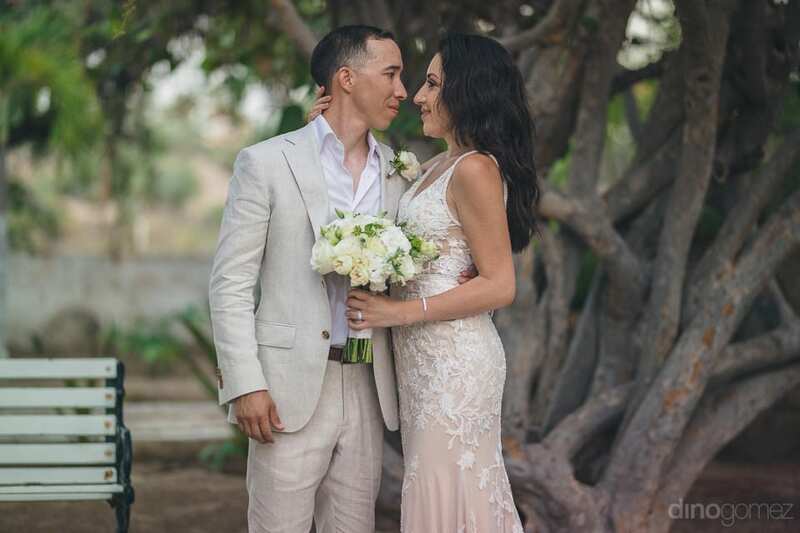 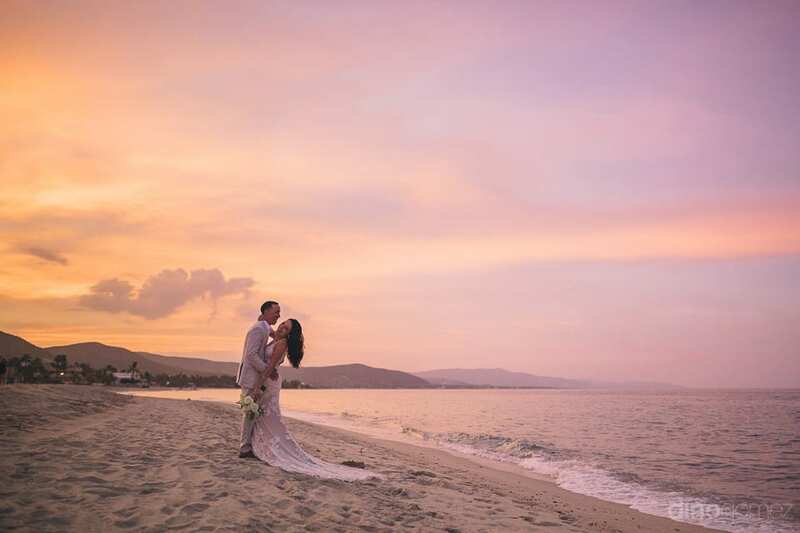 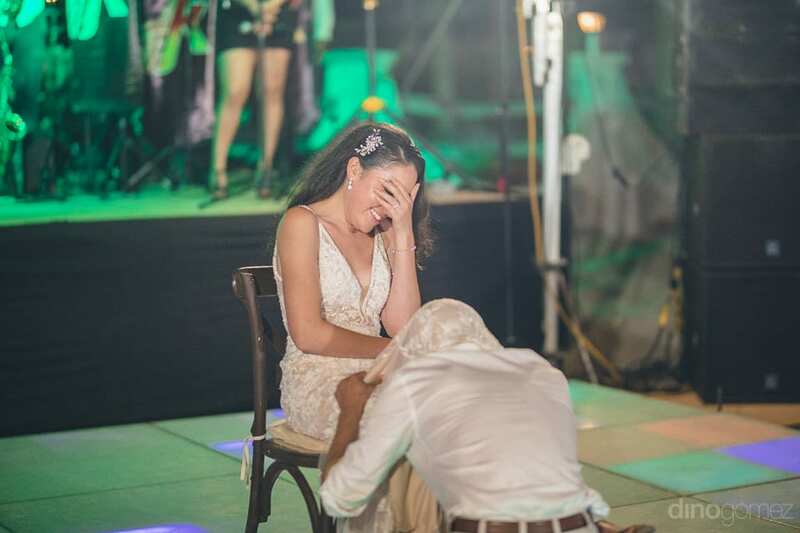 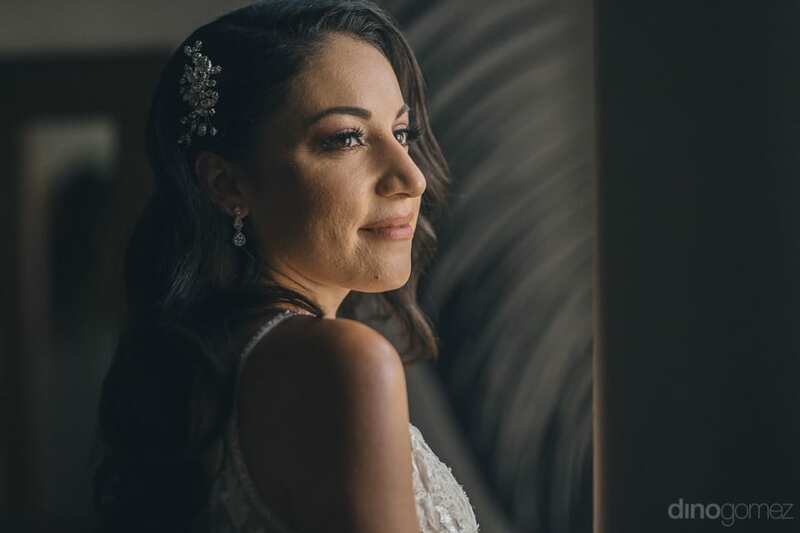 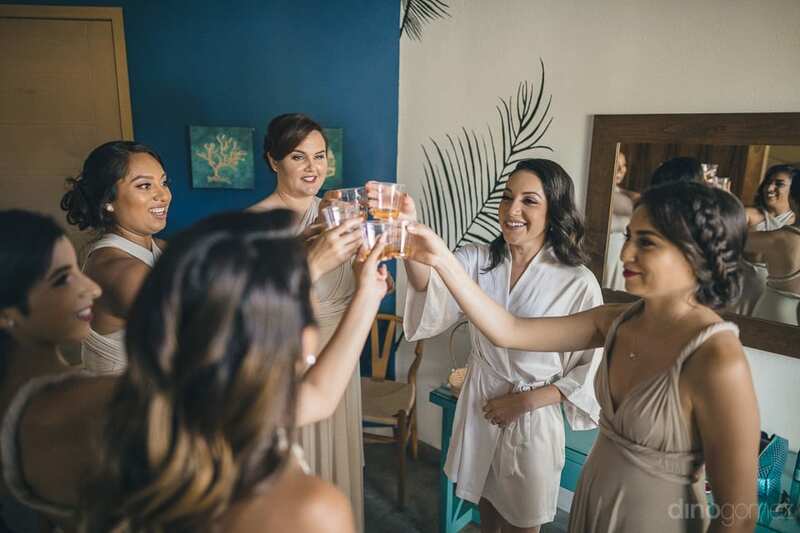 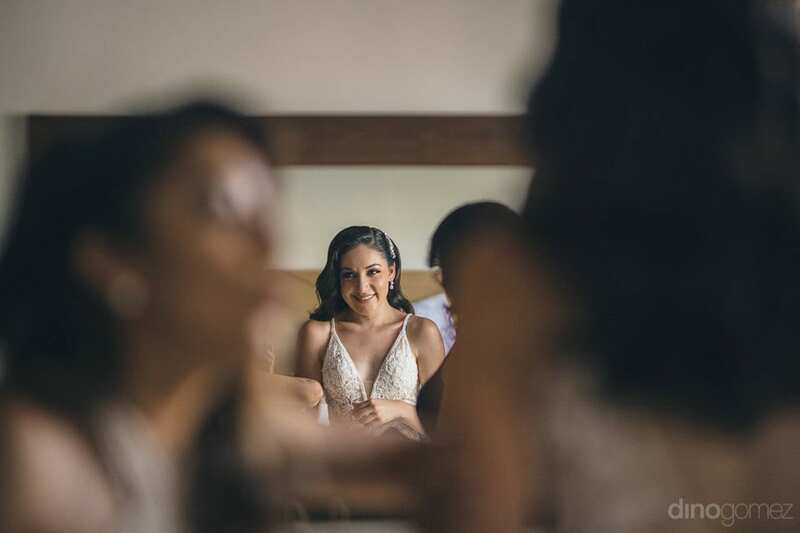 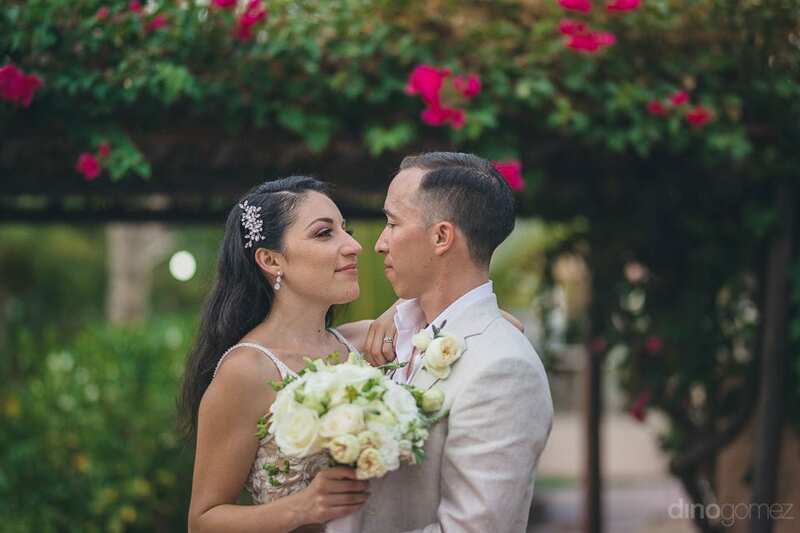 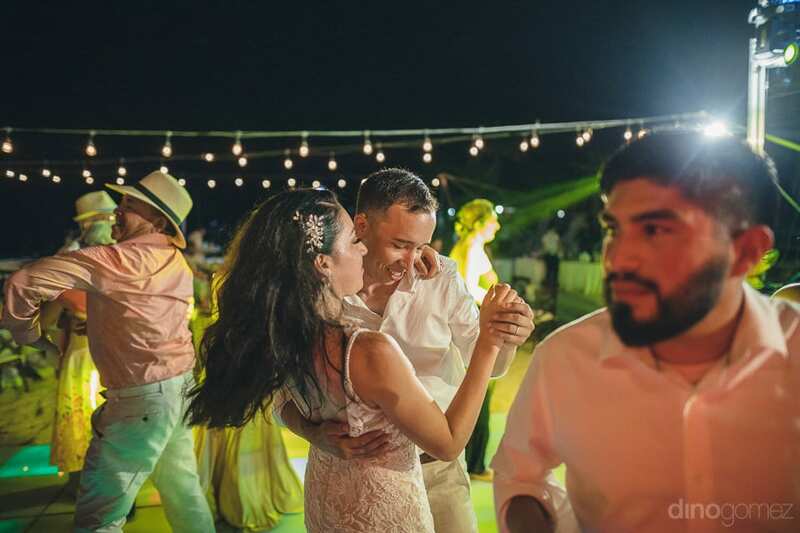 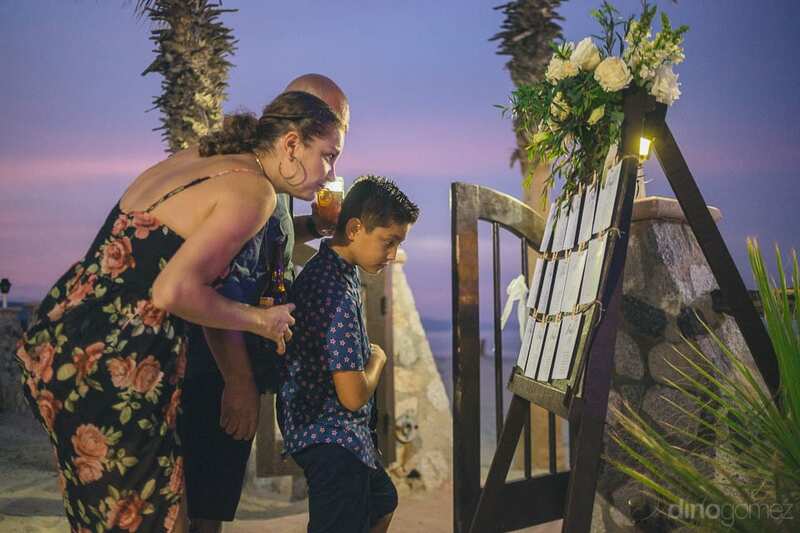 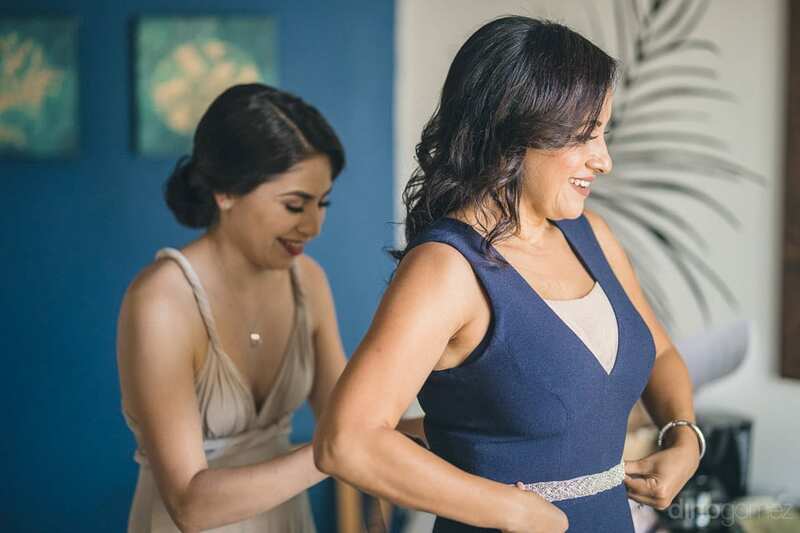 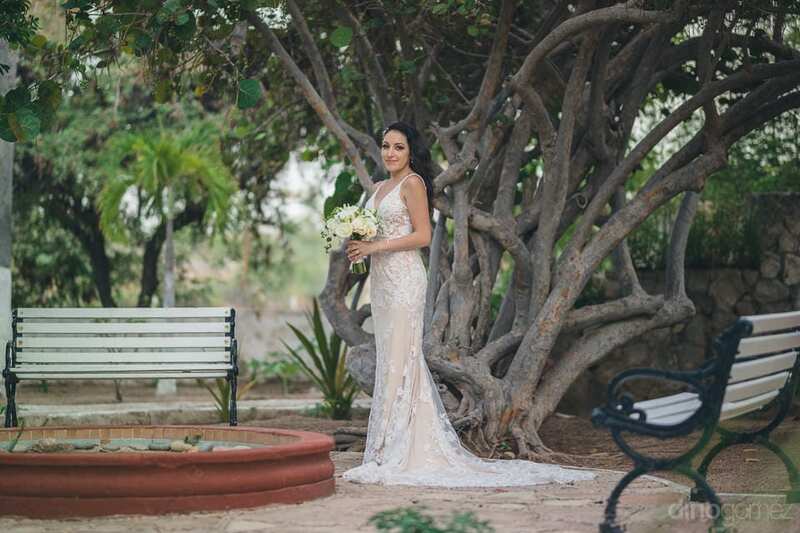 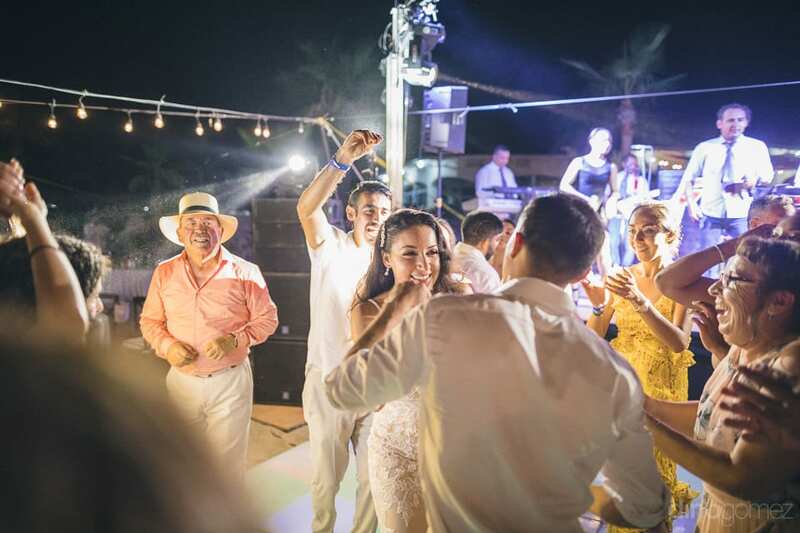 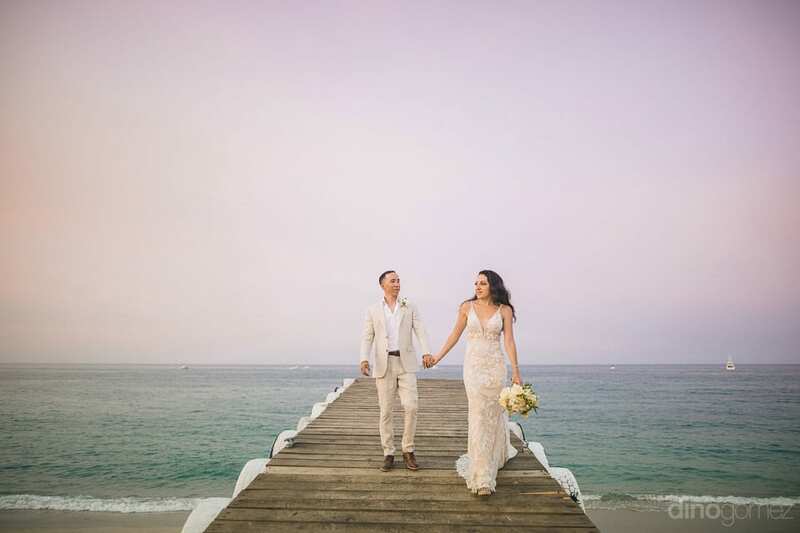 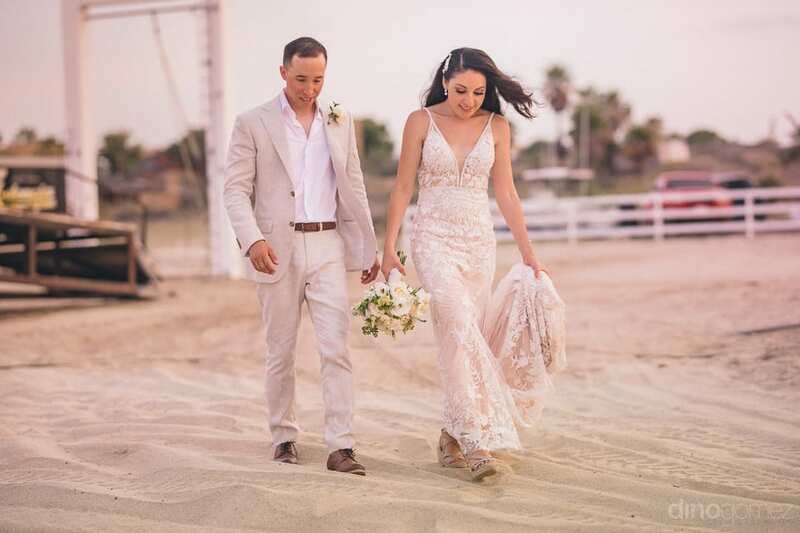 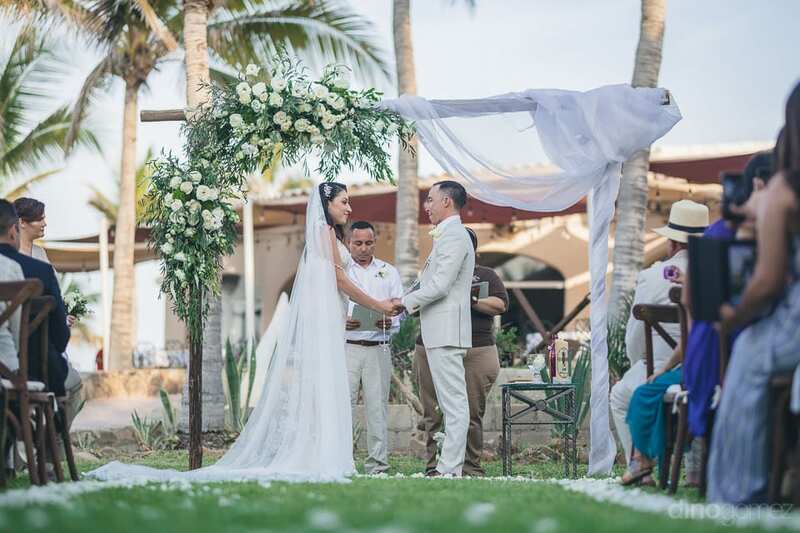 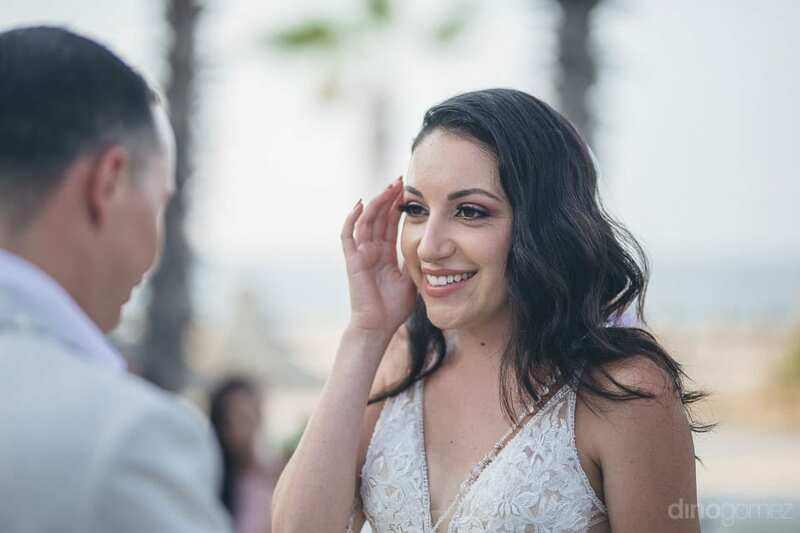 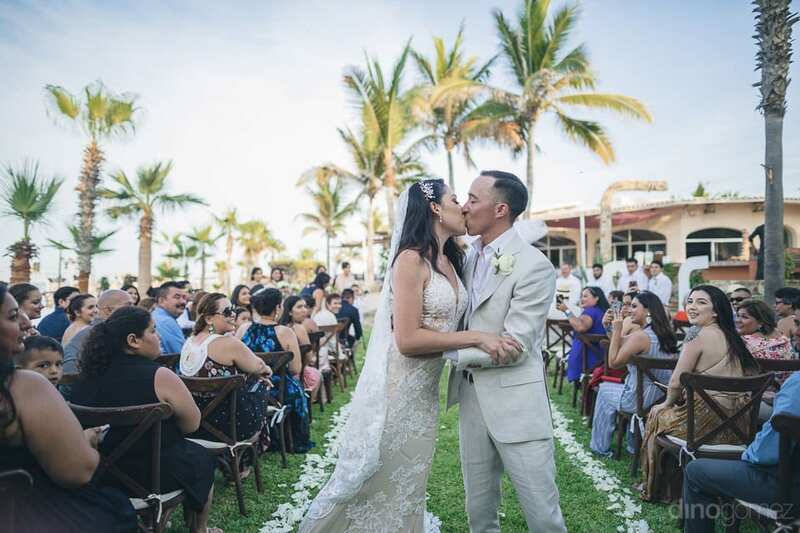 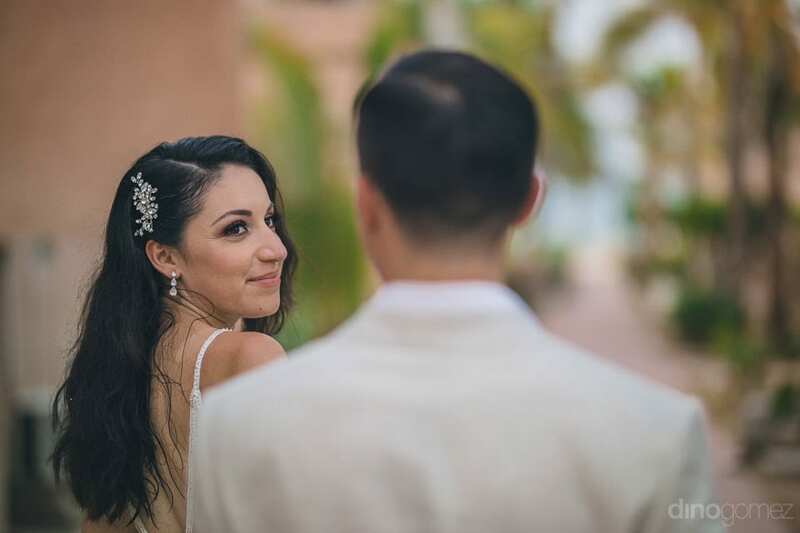 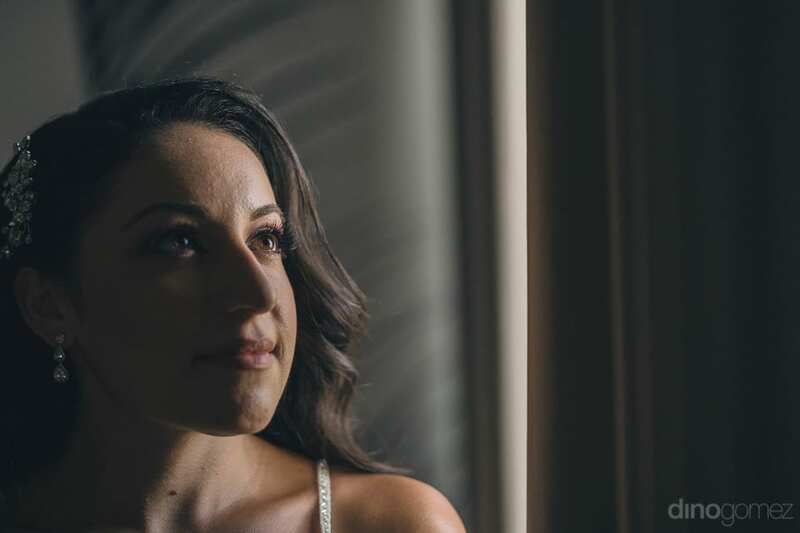 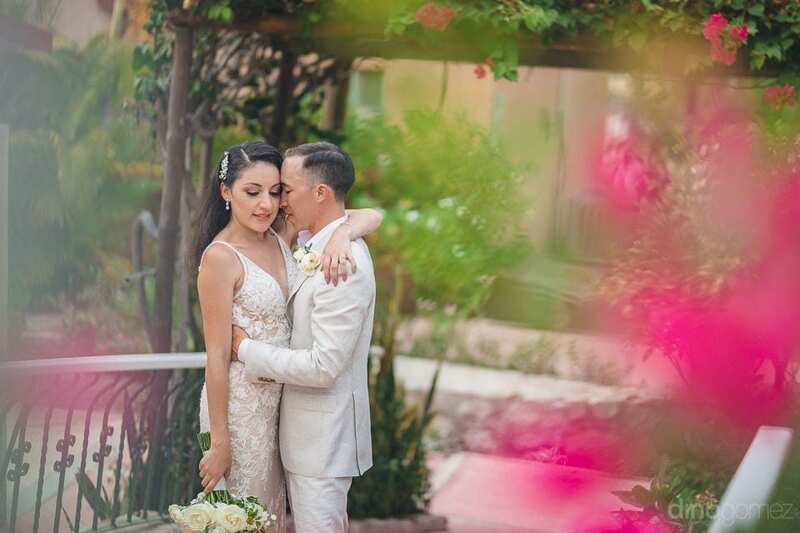 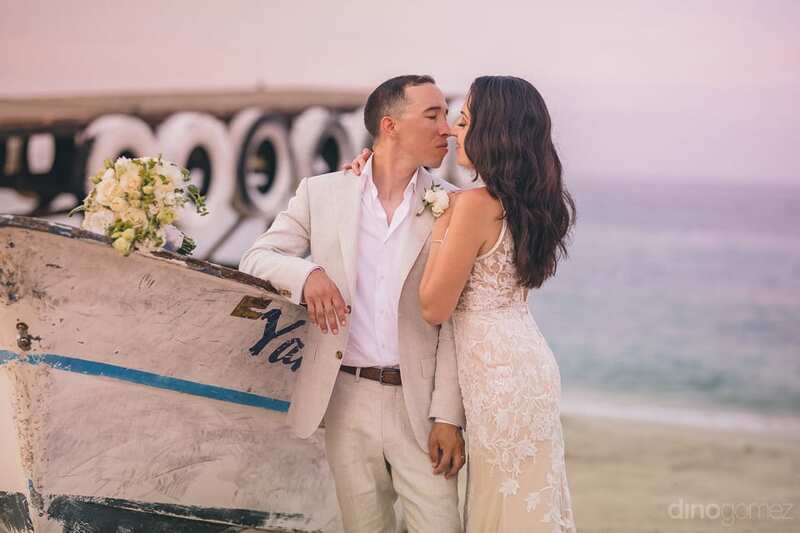 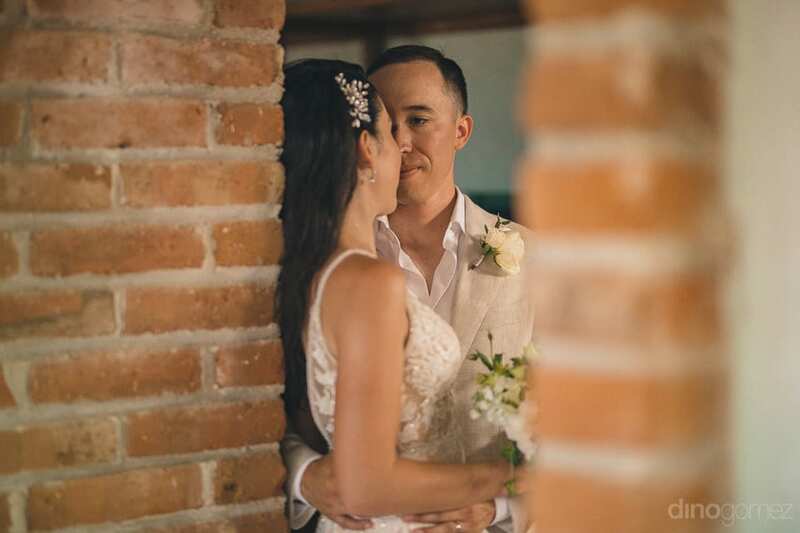 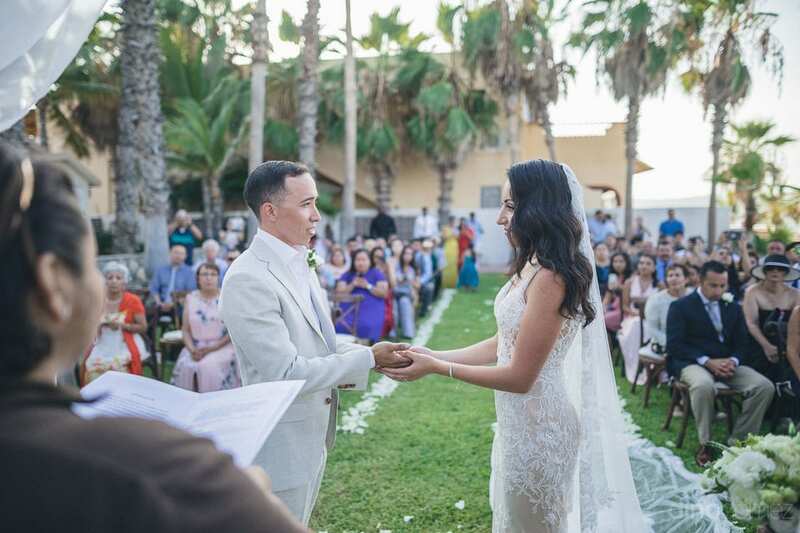 The couple wanted one of the best destination wedding photographers in Baja to capture their wedding moments with natural poses and include the scenery around the venue and thus, got their big day captured by us for the lifetime. 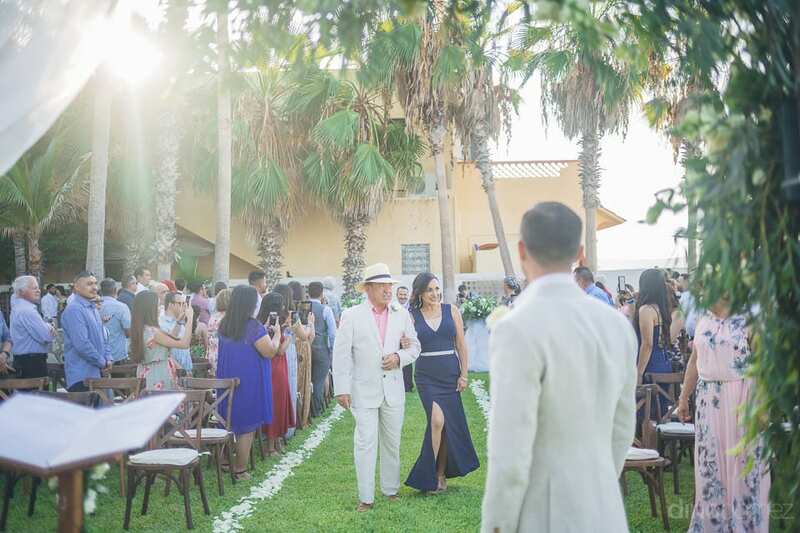 The wedding took place in the presence of their near and dear ones at the lush green garden of the hotel. 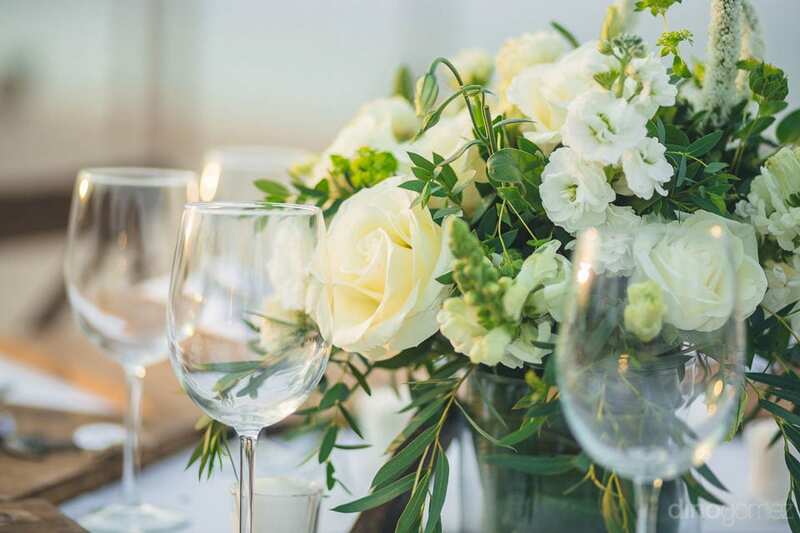 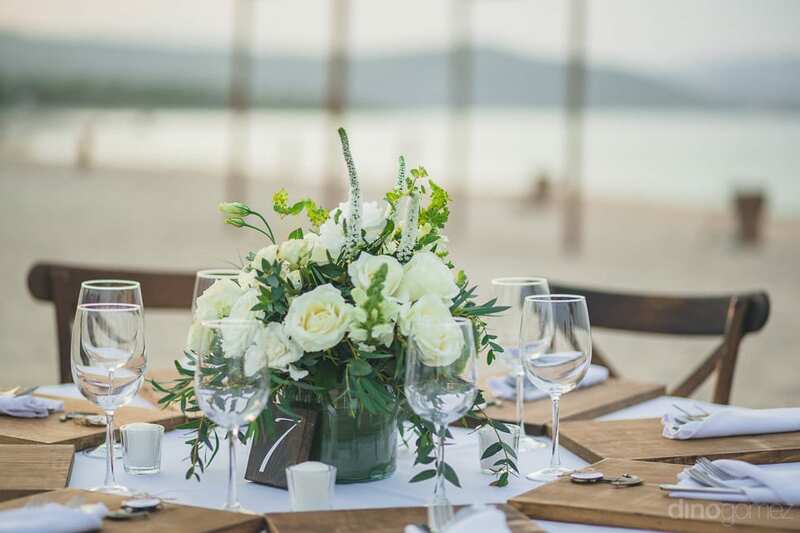 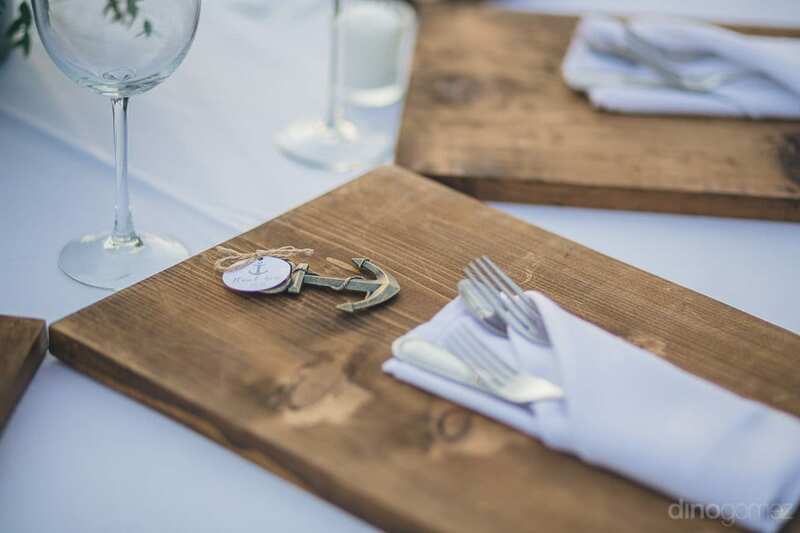 The wedding venue looked fantastic with dark wooden furniture and white flowers. 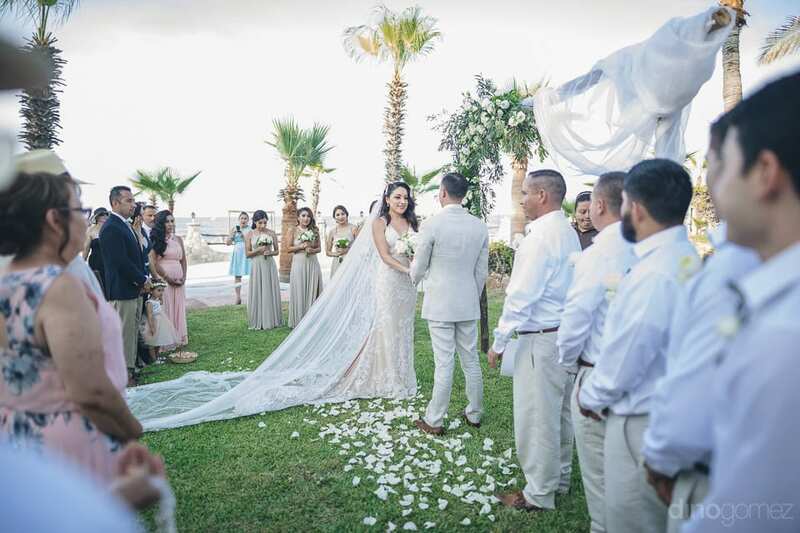 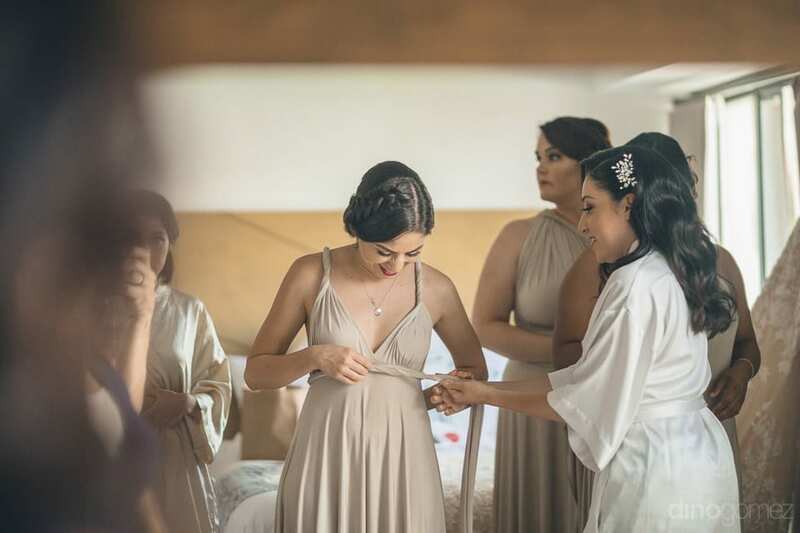 The lovely bride wore a beautiful champagne-colored wedding gown with a long floor-touching head veil at the wedding which made her look divine on the big day. 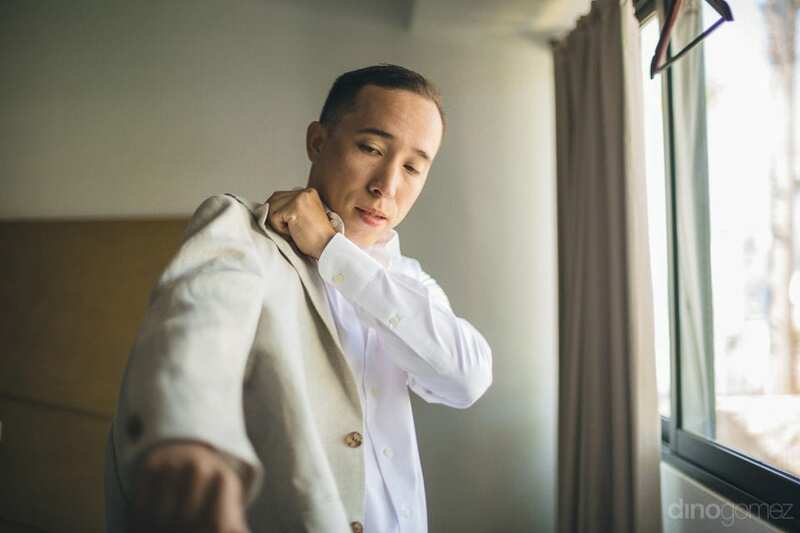 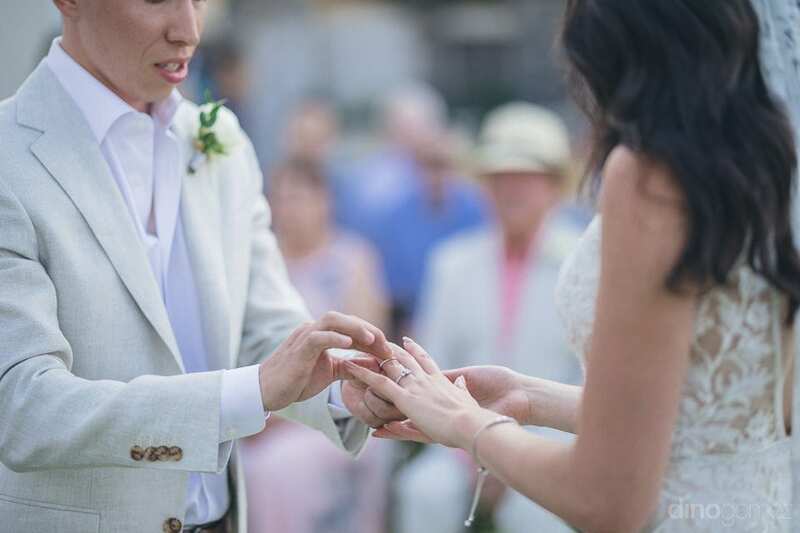 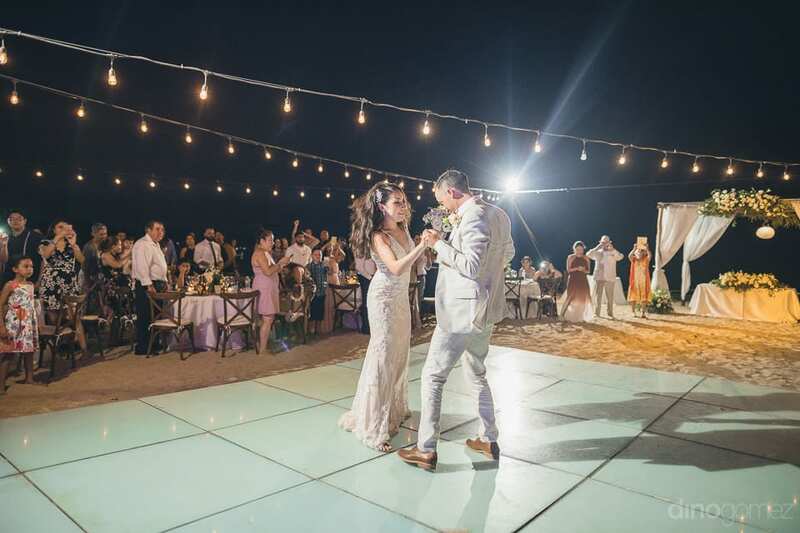 Our groom looked no less than the gorgeous bride in his champagne-colored formal suit. 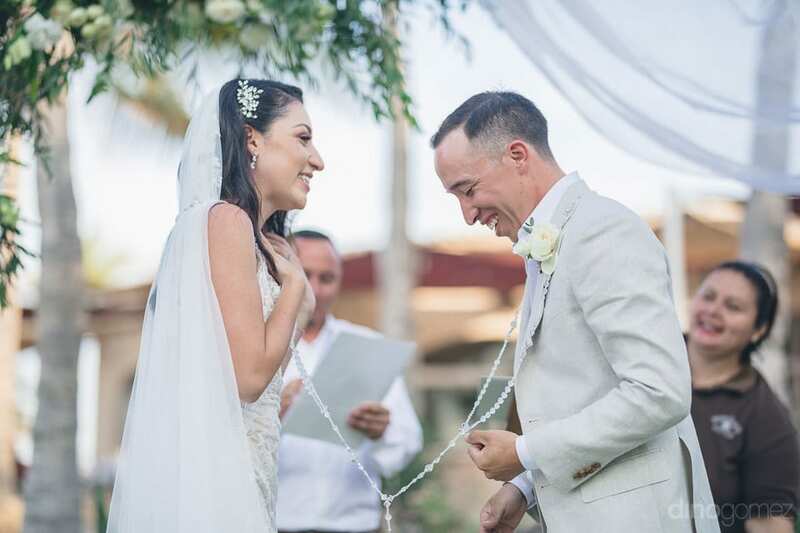 The couple complimented each other beautifully on their wedding day. 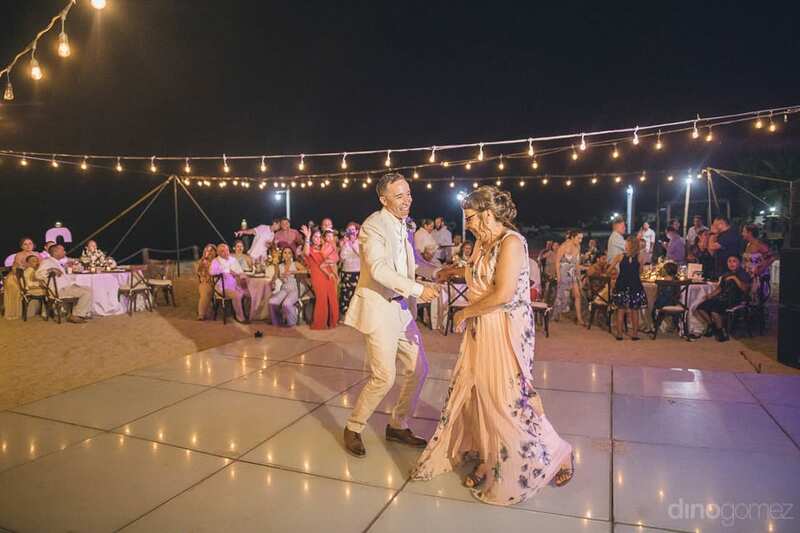 After the successful completion of wedding ceremonies, the reception took place in the evening. 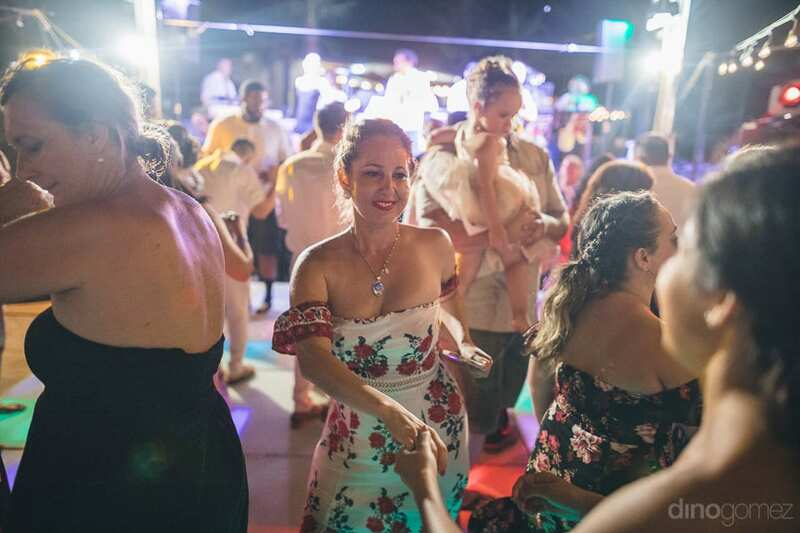 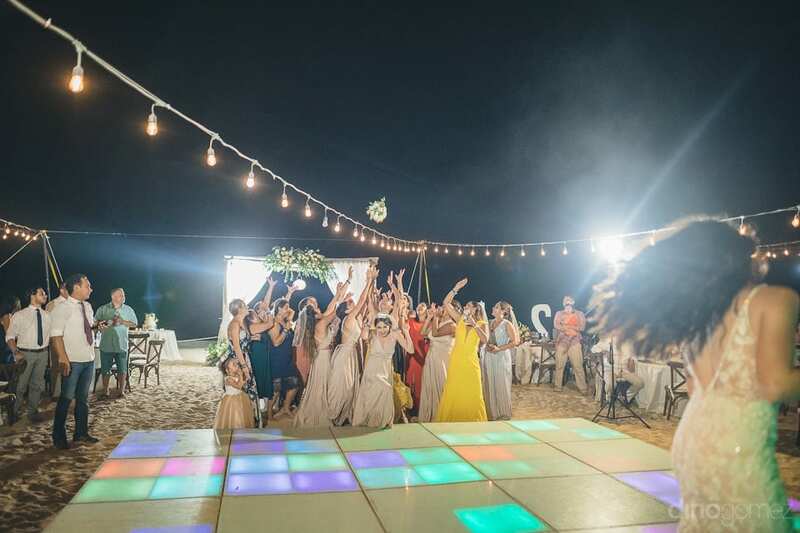 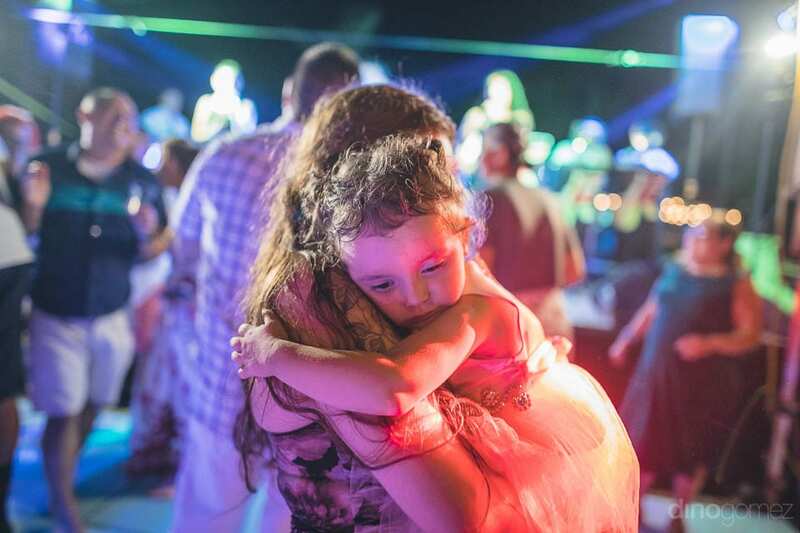 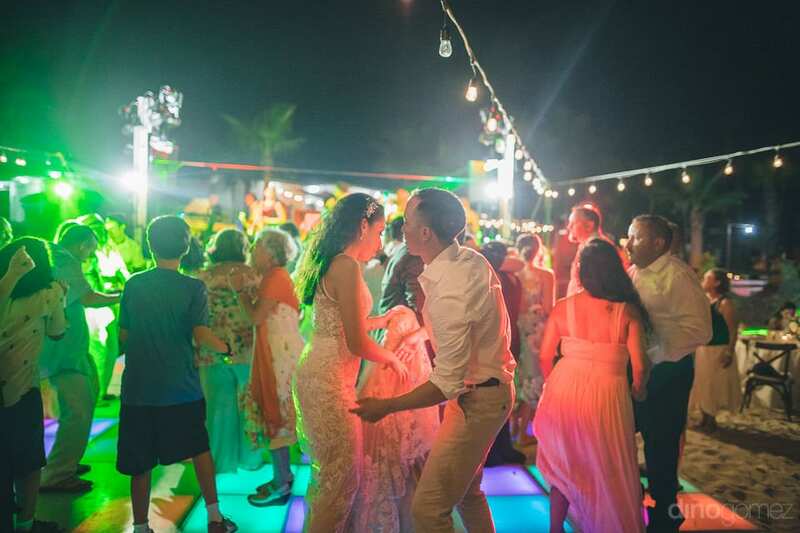 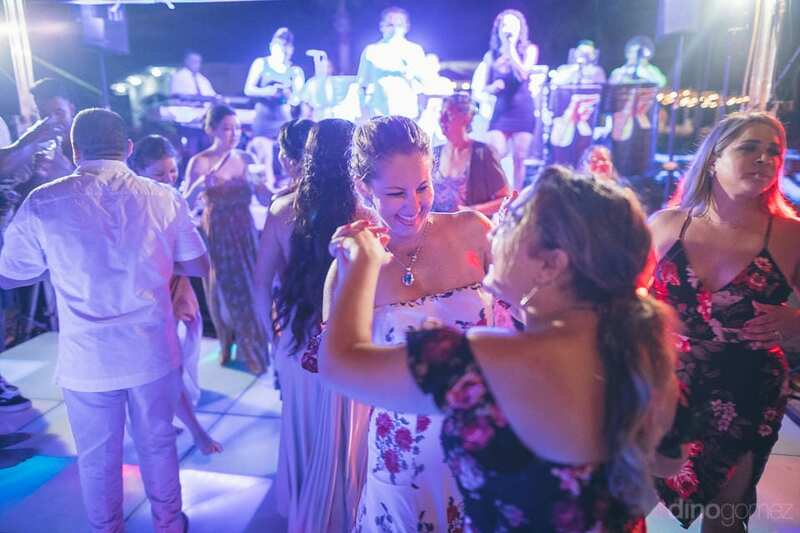 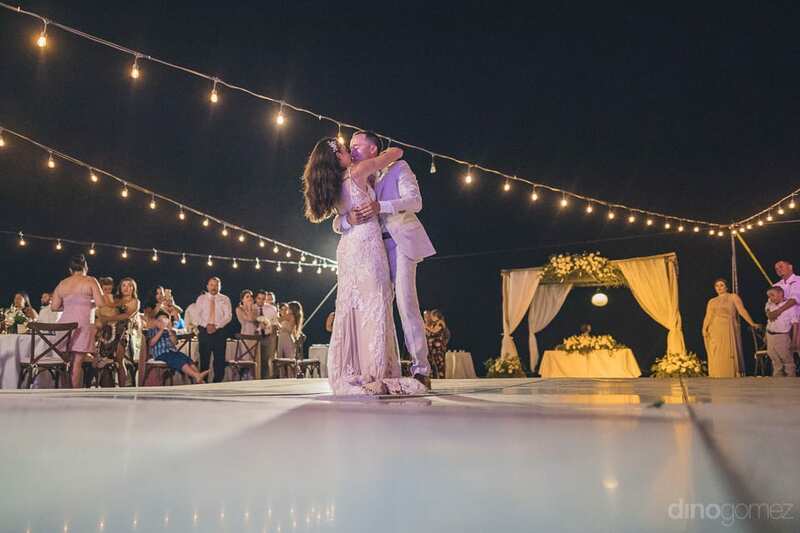 The reception venue was set at the beachside and was beautifully decorated with colorful and big LED lights under the black sky full of moon and stars. 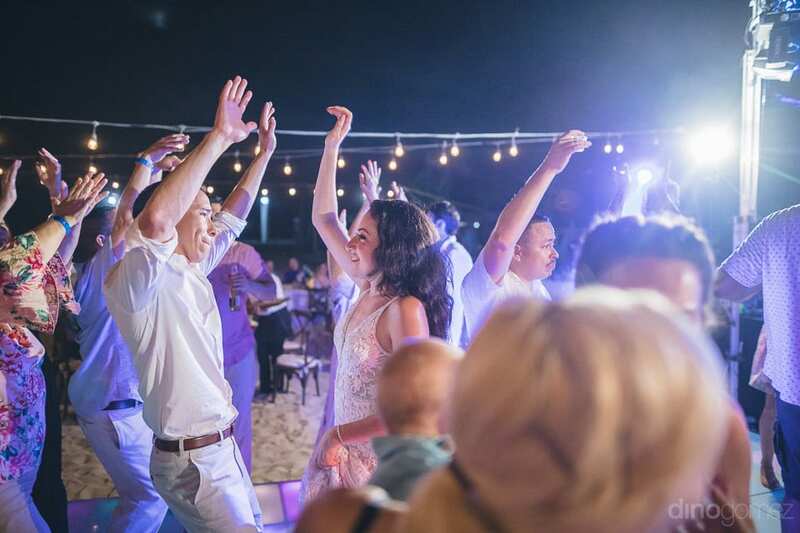 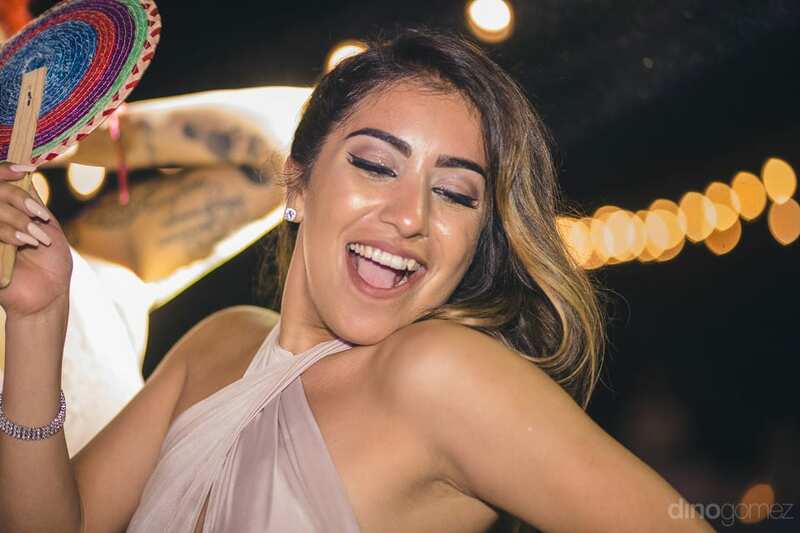 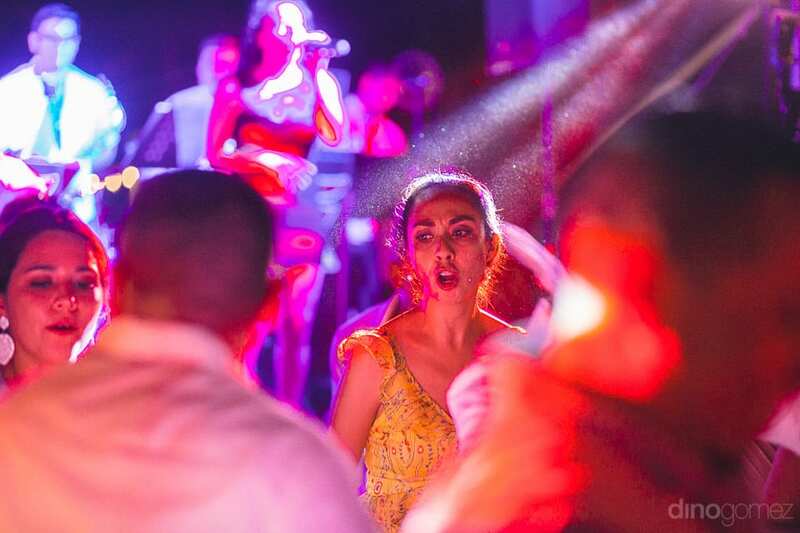 The Newly married couple enjoyed their wedding dance to the fullest and danced along with the guests at the reception party. 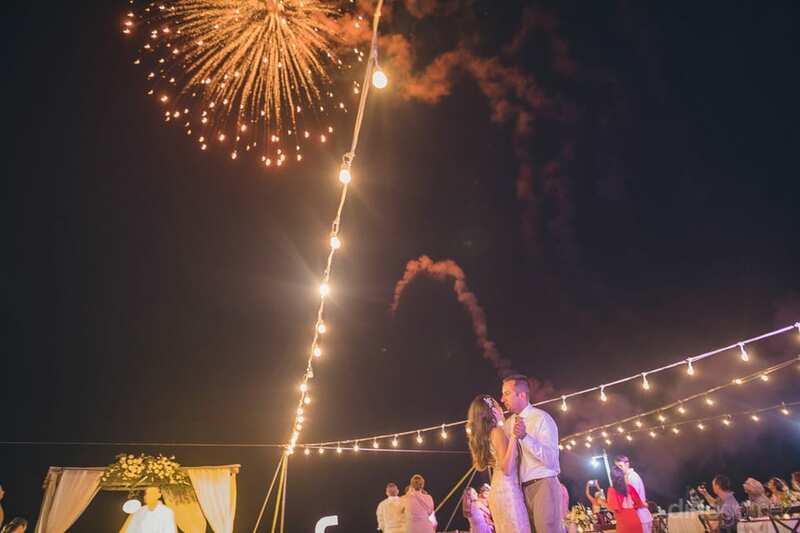 The reception fireworks were a big hit at the party. 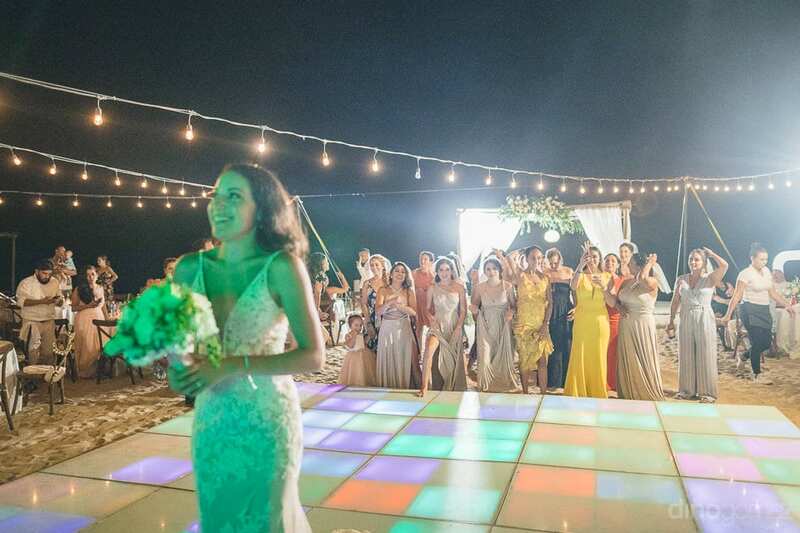 The wedding and reception party of the superb couple was a big hit. 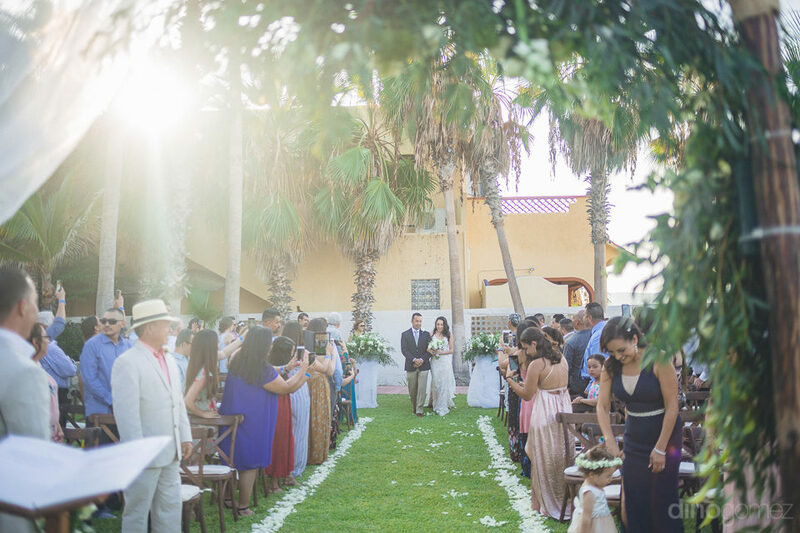 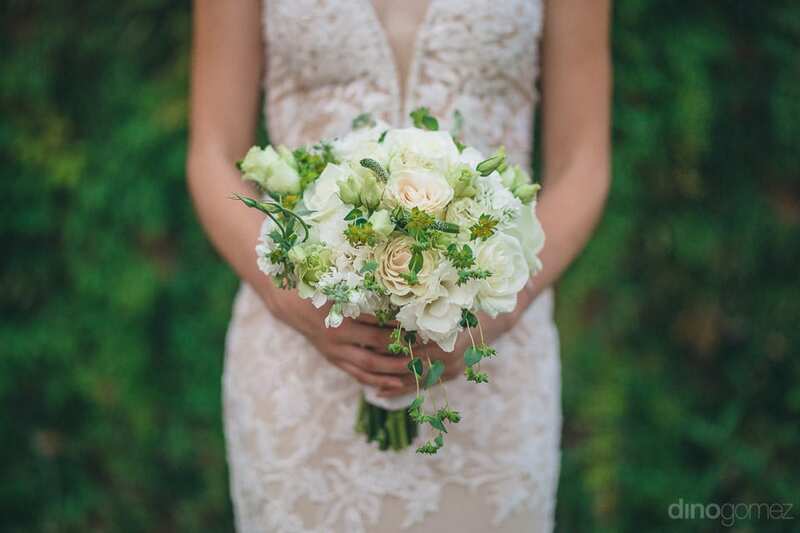 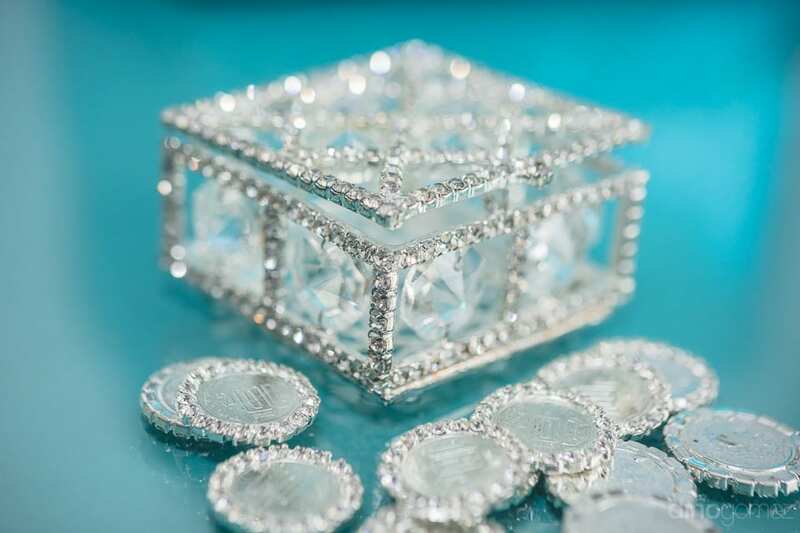 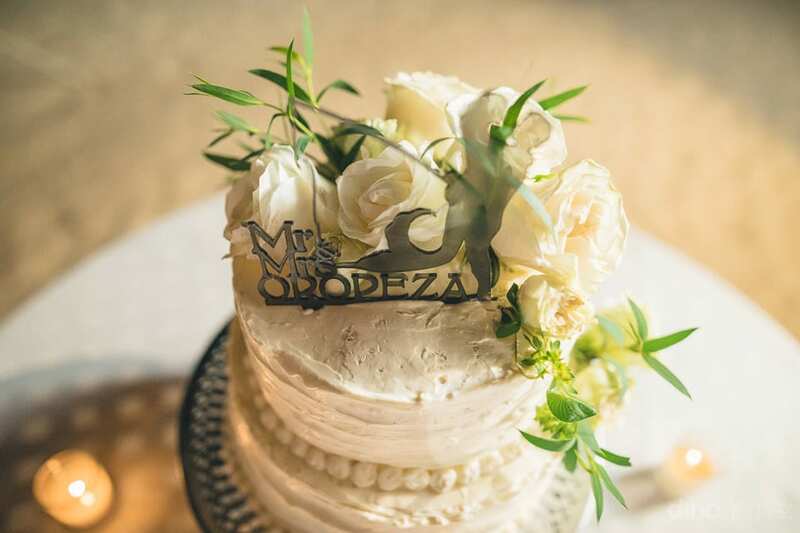 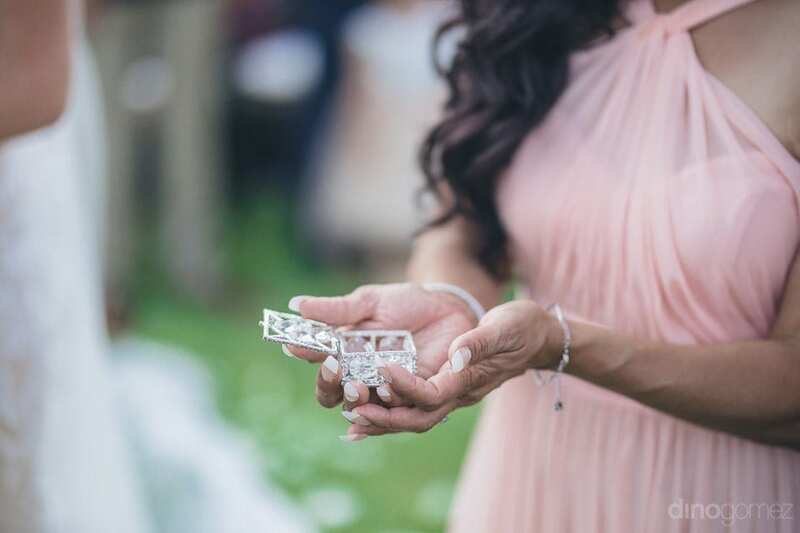 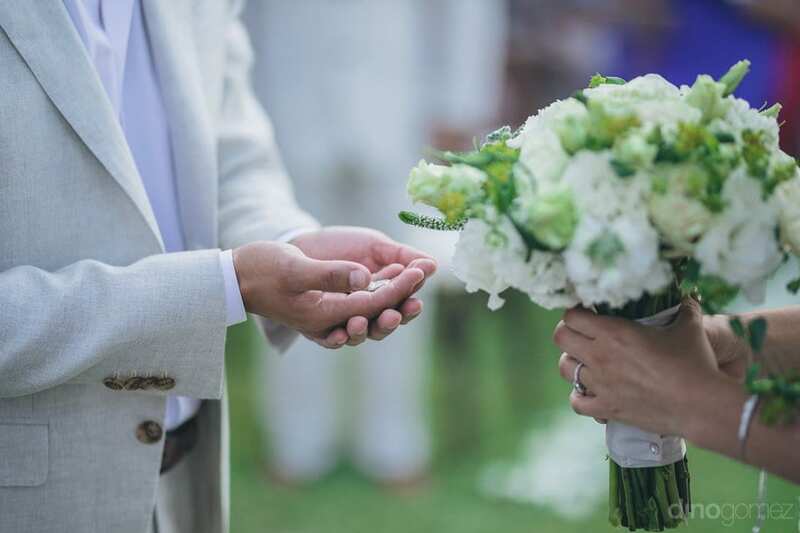 Check these featured weddings you will love! 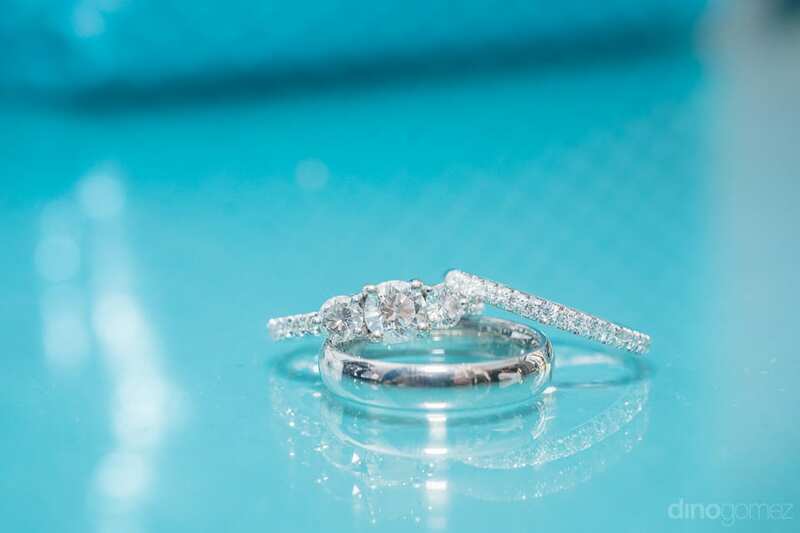 Easy and fun to work with! 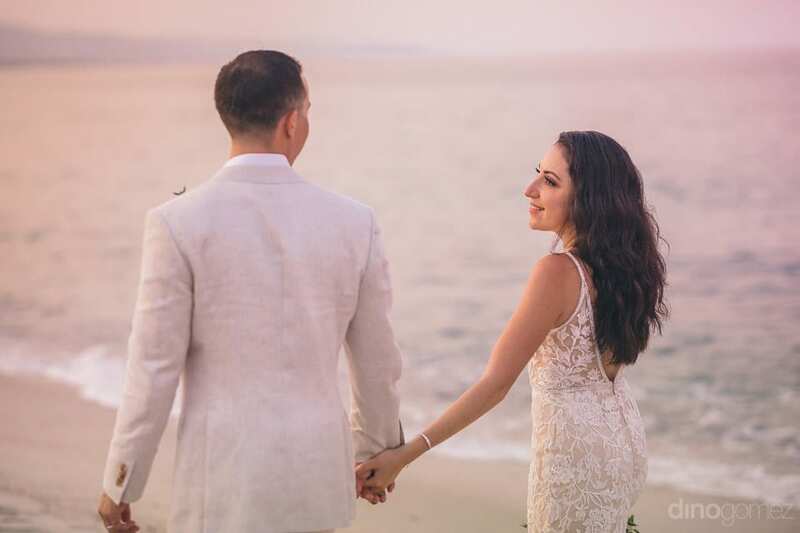 My family absolutely loved our engagement photos and they are excited to see the wedding photos next. 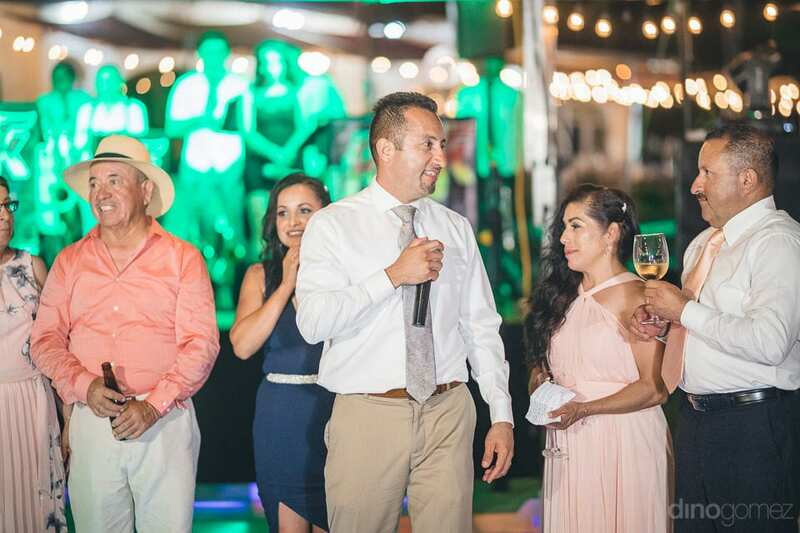 We really appreciated how timely you were with everything and how organized you were. 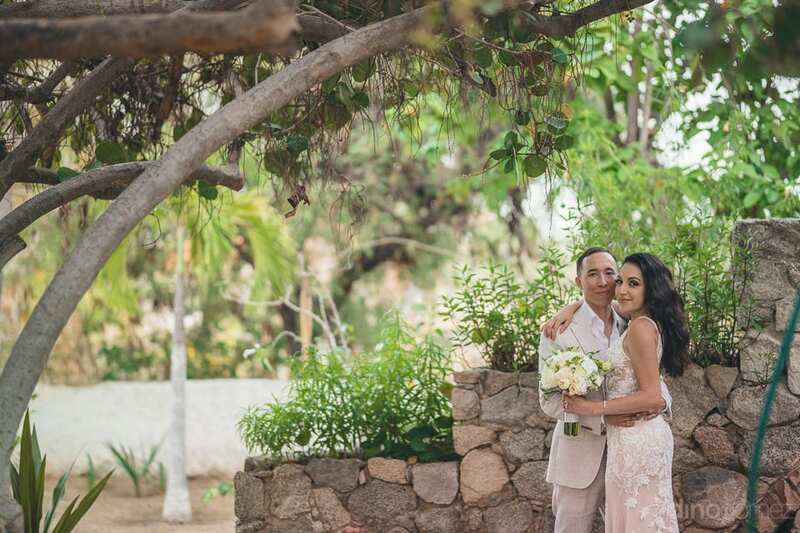 We really loved how you found different areas, in both sessions, around Bunenavista and the resort to take photos. 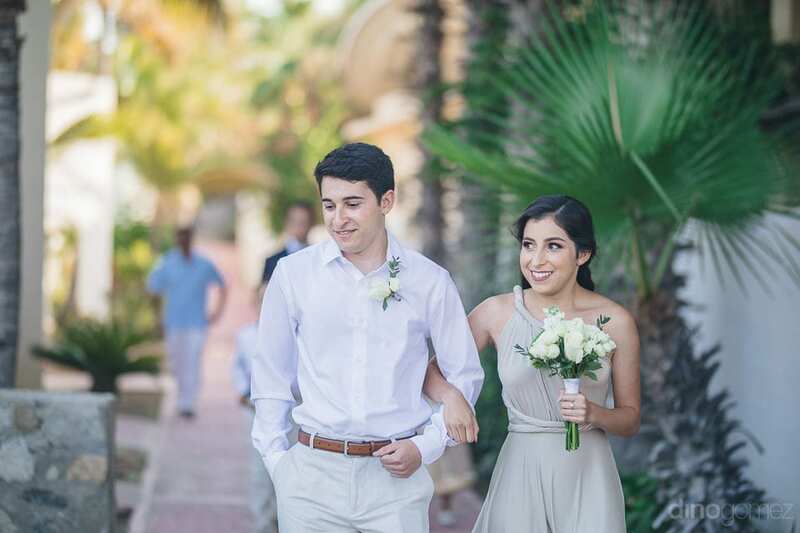 Thank you so much, Dino, for capturing our engagement and wedding for us! 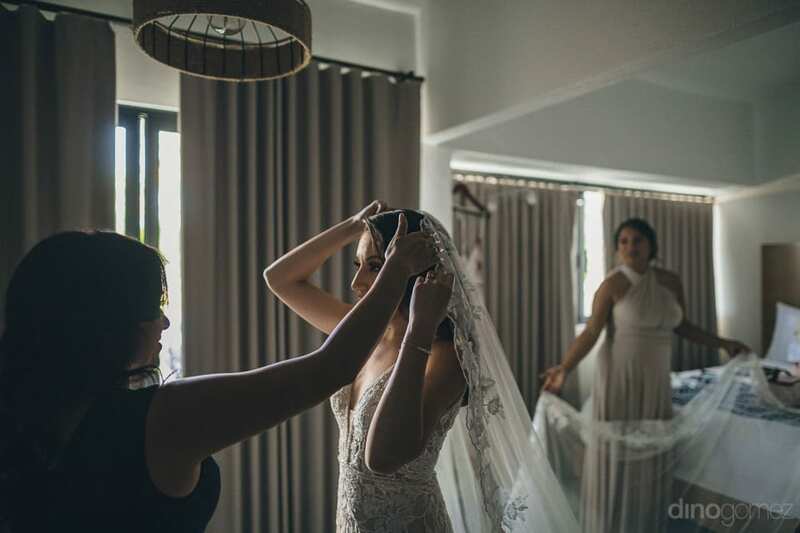 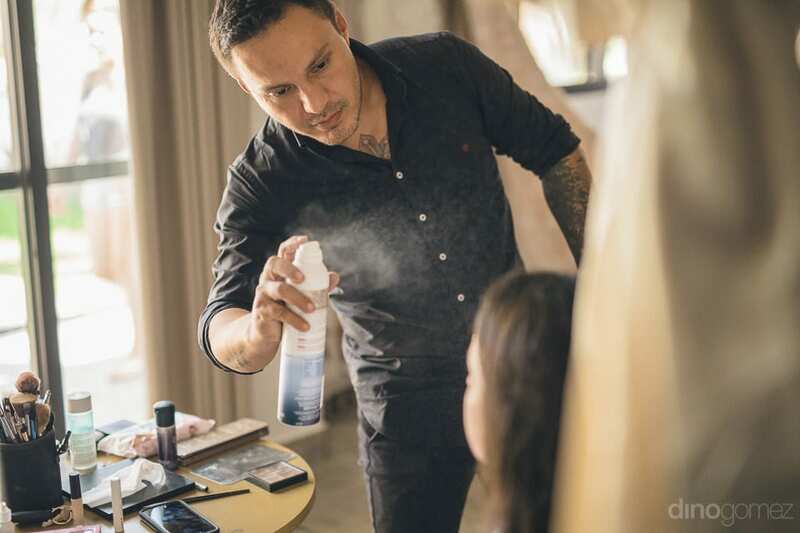 We will always recommend you!